The labour market functions quite differently from the bread market described in the previous unit because firms cannot purchase the work of employees directly but only hire their time. As we saw in Unit 6, the principal–agent model is used to explain the conflict of interest between the employer and the employee over how hard the worker works, and why this issue cannot be resolved by a contract. The outcome of the wage-setting process across all firms in the economy is the wage-setting curve, which shows the wage associated with each unemployment rate. The prices that firms charge for their products are influenced by the demand for their goods and the cost of labour, the wage. The outcome of the price-setting process across all firms is the price-setting curve, which gives the value of the real wage that is consistent with a firm’s profit-maximizing markup over production costs. Excess supply of labour (involuntary unemployment) is a feature of labour markets, even in equilibrium. If economy-wide demand for goods and services is too low, unemployment will be higher than its equilibrium level and may persist. Unions and public policies can affect labour market equilibrium. Rob, it seemed then, had been born at the right time. He entered the labour market just as the worldwide natural resources boom was taking off, driven by the demand from the rapidly growing economy of China. Rob lived in Thailand for a time, spending little, and flying into his job in Borroloola. About when Rob started work, Doug, the elder Grey, took a job at the Pilbara iron ore mine in Western Australia (WA), which paid about twice the average family income in Australia at the time. Both father and son were putting away substantial savings. But by 2015 the natural resource boom was a distant memory, and the price of ore and zinc continued to plummet. Rob and his fellow miners were worried. ‘Everybody knew the economic downturn and commodity prices were a problem. We had that in the back of our minds.’ Their dream economy couldn’t last. ‘It was … obvious … that it was coming to an end,’ Doug said. And it did. In late 2015, Rob got the bad news: ‘Two days into my break the general manager called and said, “thanks for your service, we appreciate it, we have to let you go.”’ His father, too, was laid off. Driving ore trucks is Rob’s passion and he still hopes to get back behind the wheel. But that is not going to happen, at least not at the Pilbara mine where his dad once worked. Faced with collapsing demand, the mining company cut production, and also sought to drastically reduce costs. As part of this process, they replaced human labour by machines wherever possible. In the Pilbara, nobody is behind the wheel of any of their giant robot ore trucks that are now being ‘driven’ by university graduates with joysticks 1,200 km away in Perth (we return to this process of automation and its effects on the labour market in Units 16 and 19). The rise and fall of the Grey family’s economic fortunes is all about the workings of the labour market in the mining and construction industries in Western Australia and the Northern Territory. Figure 9.1 shows that their experience was far from unusual. The boom in ore prices (in the top figure) made mining highly profitable, leading to strong demand for labour, which eventually dried up the pool of unemployed riggers and truck-drivers. Mining companies had no choice but to pay extraordinarily high salaries, and while the mining boom lasted, the companies remained highly profitable. The downturn in commodity prices began in mid-2011 and unemployment began to rise. The Grey family’s good fortunes lasted another four years. Real weekly earnings for males in Western Australia (left axis), world price of iron-ore and unemployment rate in Australia (right axis), (1989–2015). 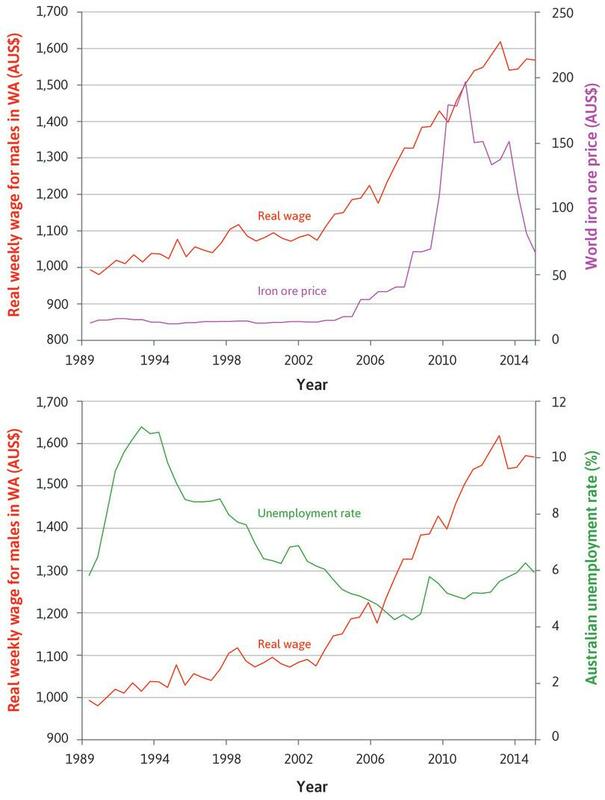 Figure 9.1 Real weekly earnings for males in Western Australia (left axis), world price of iron-ore and unemployment rate in Australia (right axis), (1989–2015). Australian Bureau of Statistics and International Monetary Fund. Note: Unemployment rates are seasonally adjusted. The chart shows real weekly earnings for males in Western Australia, together with the world price of iron-ore in the top panel and the unemployment rate in Australia in the bottom panel. 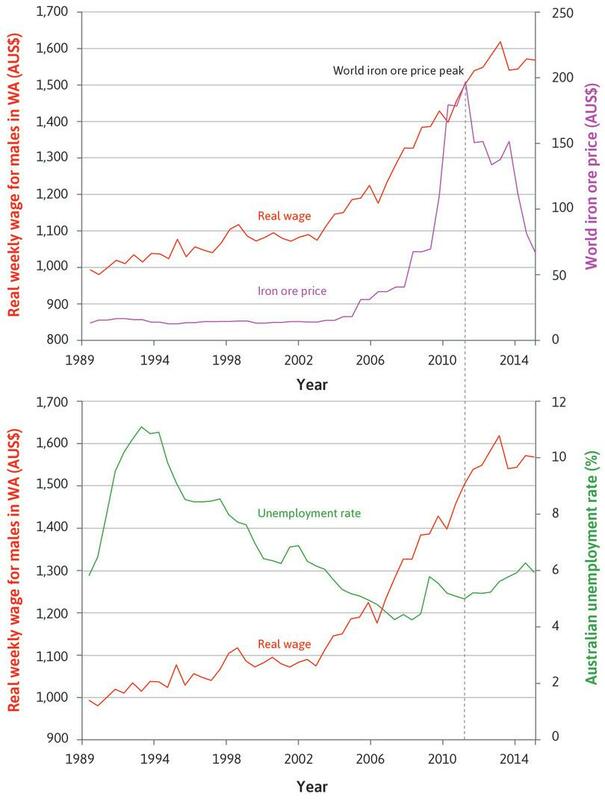 Figure 9.1a The chart shows real weekly earnings for males in Western Australia, together with the world price of iron-ore in the top panel and the unemployment rate in Australia in the bottom panel. Following the peak in iron-ore prices, real wage growth slowed and unemployment began to rise. Figure 9.1b Following the peak in iron-ore prices, real wage growth slowed and unemployment began to rise. In this unit, we describe how the labour market works and why even in equilibrium, the supply of labour (number of people seeking jobs) exceeds the demand for labour (number of jobs offered). Those without work in this situation are termed the involuntary unemployed (to distinguish them from those who are unemployed by choice, but are looking for a job). In previous units we have looked at particular markets—buying and selling bread, for example—and sometimes at a single firm. Here we model the labour market of an entire economy, which determines the amount of unemployment in the population as a whole. We look at price-setting firms, selling differentiated products (as described in Unit 7), and a large number of identical workers who may be employed by the firms for the same wage set by the firm (as studied in Unit 6). We consider the simple case in which the only input to production is labour, so that the only cost is the wage, and profits are determined by just three things: the nominal wage (the actual amount received in a particular currency), the price at which the firm sells its goods, and the average output produced by a worker in an hour. The labour market brings together two earlier themes: the firm and its employees (Unit 6) and the firm and its customers (Unit 7). Two things you have learned will be essential to seeing how the labour market functions. In order to motivate employees to work hard and well, firms must set the wage sufficiently high so that the worker receives an employment rent. This means there is a cost of job loss: she is better off being employed than being fired due to inadequate effort. If the worker is very likely to find alternative work if she is fired, which will be the case if the employment level in the economy is high, she will need a higher wage to work hard. Think of wage-setting as the business of the human resources (HR) department of the firm. In setting the price of the good they sell, firms face a trade-off between selling more goods and setting a higher price, due to the demand curve they face. To determine the price to set, the firm finds the markup over their production cost that balances the gains from a higher price against the losses from lower sales so as to maximize its profits. This profit-maximizing markup determines the division of the firm’s revenues between profits and wages. Think of price setting as the business of the marketing department of the firm. First, each firm decides what wage to pay, what price to charge for its products, and how many people to hire. Then, adding up all of these decisions across all firms gives the total employment in the economy and the real wage. The human resources department determines the lowest wage it can pay: It must not undermine the workers’ motivation to work, and its decision is based on the prices of other firms’ products, the wages the other firms are paying, and the unemployment rate in the economy. This is the nominal wage set by the firm. It communicates this information to the marketing department. The marketing department sets the price: This is based on the firm’s nominal wage and the shape and position of the demand curve facing the firm. For example, if the demand curve is elastic, indicating a high level of competition from other firms, it will set a lower price. Setting the price is the same thing as fixing the size of the markup over the cost of hiring labour. Given the position of the demand curve, which indicates the level of economy-wide demand, the marketing department then determines the amount of output the firm will sell. It communicates this information to the production department (PD). The production department then calculates how many employees have to be hired to produce the output determined by the marketing department, based on the firm’s production function. The wage-setting curve: This gives the real wage necessary at each level of economy-wide employment to provide workers with incentives to work hard and well. The price-setting curve: This gives the real wage paid when firms choose their profit-maximizing price. In the next section we look at how employment and unemployment are measured. After that, we introduce the wage-setting curve using the model of wage-setting from Unit 6. Then we describe how a single firm determines its employment level using the model of price setting from Unit 7. This will provide a reason why the price-setting curve is essential to understanding the labour market in the economy as a whole. We then show how the two curves together determine the equilibrium level of employment, the real wage, and the distribution of income between wages and profits. Finally, we use this model to explore the effect of changes in public policy such as taxation of firms’ profits and workers’ wages, subsidies to firms for hiring more labour, changes in the unemployment insurance benefit received by those out of work, and changes in the degree of competition among firms. To maximize profits, firms set the wage at the level where the workers are indifferent between working and not working. Firms aim to set as high a price as possible. In equilibrium, the wage clears the labour market, so there is no unemployment. If all firms set the same price and pay the same nominal wage, then the higher the real wage that they pay, the lower is their markup. In order to motivate employees to work hard and well, firms set the wage sufficiently high so that workers receive an employment rent, in other words, there is a nonzero cost of job loss. There is a trade-off between a higher price/markup and quantity of sales. A firm chooses the price at which its profit is maximized. In labour market equilibrium there is involuntary unemployment, as the wage has to be set at a level higher than the full-employment level in order to motivate employees to work hard and well. The real wage is W/P while the markup is (P − W)/P = 1 − (W/P). So the higher the former, the lower the latter. Figure 9.2 provides an overview of the labour market and shows how these components fit together. We begin on the left-hand side with the population. The next box shows the population of working age. This is the total population, minus children and those over 64. It is divided into two parts: the labour force and those out of the labour force (known as inactive). People out of the labour force are not employed or actively looking for work, for example, people unable to work due to sickness or disability, or parents who stay at home to raise children. Only members of the labour force can be considered as employed or unemployed. Figure 9.2 The labour market. It is important to note that the denominator (the statistic on the bottom of the fraction) is different for the unemployment and the employment rate. Hence, two countries with the same unemployment rate can differ in their employment rates if one has a high participation rate and the other has a low one. The table in Figure 9.3 provides a picture of the Norwegian and Spanish labour markets between 2000 and 2015, and shows how the labour market statistics relate to each other. It also shows that the structure of the labour market differs widely across countries. We can see that the Norwegian labour market worked better than the Spanish labour market in the last 15 years: Norway had a much higher employment rate and a much lower unemployment rate. Norway also had a higher participation rate, which is a reflection of the higher proportion of women in the labour force. Labour market statistics for Norway and Spain (averages over 2000–2015). Figure 9.3 Labour market statistics for Norway and Spain (averages over 2000–2015). International Labour Association. 2015. ILOSTAT Database. Norway and Spain are illustrations of two common cases. Norway is a low-unemployment, high-employment economy (the other Scandinavian countries—Sweden, Denmark, and Finland—are similar) and Spain is a high-unemployment, low-employment economy (the other southern European economies—Portugal, Italy and Greece—are other examples). Other combin­ations are possible, however: South Korea is an example of an economy that has both a low unemployment rate and a low employment rate. Visit the ILO’s website and use the ILOSTAT Database to calculate the employment, unemployment, and participation rates for two economies of your choice. Describe the differences in these two countries’ data and compare them with Spain and Norway. Choose a visual representation of the data (for example, using the graph function of your spreadsheet software) and explain your choice. After studying this unit, use the model of the labour market to suggest possible reasons for the differences in unemployment rates in these countries. You may need to find out more about the two countries’ labour markets. This is the definition of the employment rate. unemployment rate = unemployed ÷ labour force, while employment rate = employed ÷ population of working age. They do not add up to 1 because the denominator is different. We now build a model of the labour market that can help to explain differences in unemployment rates across countries, and changes over time within a country. To do this, we broaden the perspective from the single firm in Unit 6 to the whole economy, and we ask how changes in the unemployment rate affect the wage set by employers. In Figure 9.4, the horizontal axis represents the proportion of the working-age population, and goes up to a value of 1. The vertical axis is the economy-wide wage. The labour force is the vertical line furthest to the right: it has a value less than 1, depending on the participation rate. Inactive workers are to the right of the labour force line. The employment rate is the vertical line to the left of the labour force, indicating the share of the population who are actually working. The unemployment rate is the proportion of those in the labour force who are not employed: that is, those workers in between the employment rate line and the labour force line. 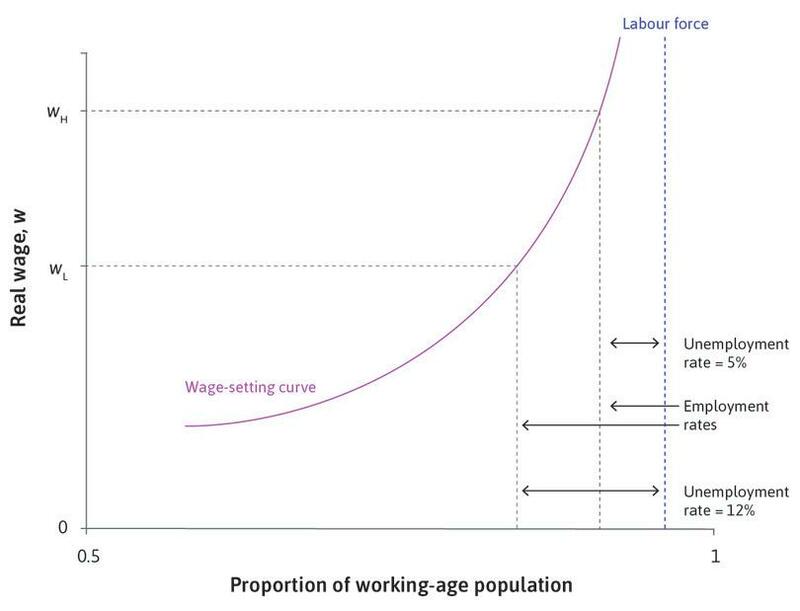 The wage-setting curve: Labour discipline and unemployment in the economy as a whole. 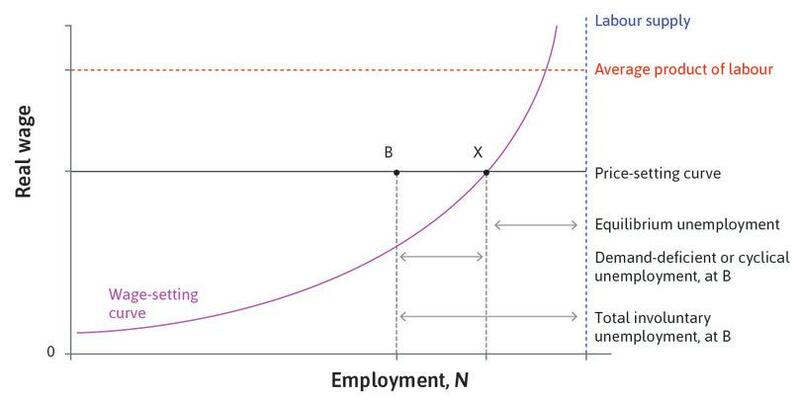 Figure 9.4 The wage-setting curve: Labour discipline and unemployment in the economy as a whole. The upward-sloping line is called the wage-setting curve. Figure 9.4a The upward-sloping line is called the wage-setting curve. At 12% unemployment in the economy, the employee’s reservation wage is low and the worker will put in a high level of effort for a relatively low wage. The firm’s profit-maximizing wage is therefore low. Figure 9.4b At 12% unemployment in the economy, the employee’s reservation wage is low and the worker will put in a high level of effort for a relatively low wage. The firm’s profit-maximizing wage is therefore low. At 5% unemployment in the economy, the employee’s reservation wage is high and they will not put in much effort unless the wage is high. The firm’s profit-maximizing wage is therefore higher. Figure 9.4c At 5% unemployment in the economy, the employee’s reservation wage is high and they will not put in much effort unless the wage is high. The firm’s profit-maximizing wage is therefore higher. The upward-sloping line is called the wage-setting curve. Like the best-effort response function of the employee on which it is based, the wage-setting curve is a mathematical version of an ‘if-then’ statement: if the employment rate is x, then the Nash equilibrium wage will be w. This means that at the employment rate x, the wage w is the result of both employers and employees doing the best they can in setting wages and responding to the wage with a given amount of effort, respectively. This statement is true because the wage-setting curve for the whole economy is based directly on the employer’s wage-setting decision and the employee’s effort decision in an economy that is composed of many firms like the one we modelled in Unit 6. We show how to do this in Figure 9.5 by bringing together Figure 9.4 (the economy-wide wage-setting curve) and Figure 6.6 (how the firm sets the wage). The top panel of Figure 9.5 shows the employee’s best response curve at the two unemployment rates of 12% and 5%. As we saw in Unit 6, a higher unemployment rate reduces the reservation wage, because a worker faces a longer expected period of unemployment if he or she loses a job. This weakens the employees’ bargaining power and shifts the best response curve to the left. 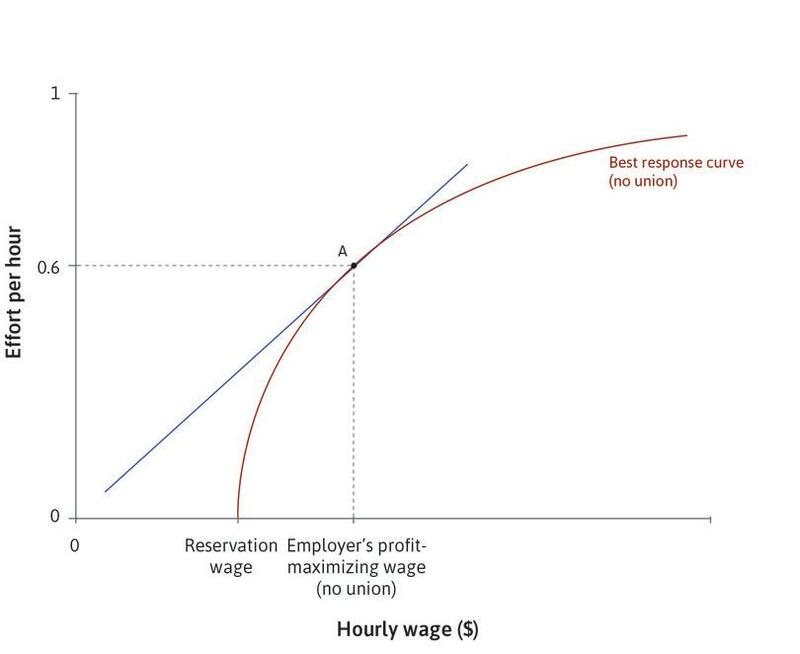 With an unemployment rate of 12%, the reservation wage is shown by point F. The employer’s profit-maximizing choice is point A with the low wage (wL). Deriving the wage-setting curve: Varying the unemployment rate in the economy. Figure 9.5 Deriving the wage-setting curve: Varying the unemployment rate in the economy. In the lower panel, we plot point A. The dashed line from unemploy­ment of 12% indicates that the wage is set at wL. We now assume a fixed size for the labour force and the horizontal axis gives the number of workers employed, N. As employment increases to the right, the unemployment rate falls. Using exactly the same reasoning, we find the profit-maximizing wage set when unemployment is much lower at 5%. Both the reservation wage and the wage set by the employer are higher, as shown by point B. This gives the second point on the wage-setting curve in the lower panel. 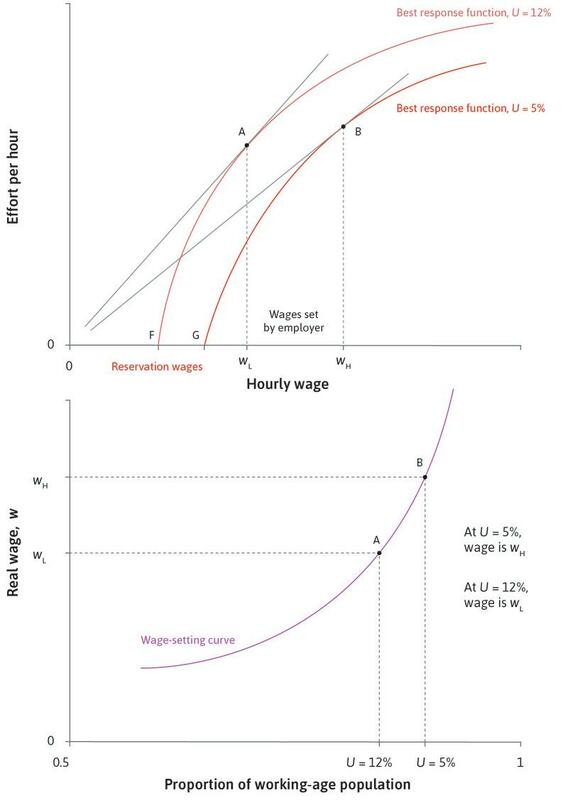 We derived the wage-setting curve as part of the labour discipline model, which was designed to illustrate how employees and firm owners (and their managers) interact when setting wages and determining the level of work effort. We will use the same model later when we describe policies to alter the level of unemployment in the entire economy. Later in this unit and in Units 16 and 17 we will look at the ways in which labour unions can affect the wage-setting process and so alter the workings of the labour market. Wage-setting curves have been estimated for many economies. Read how it is done in an article by David Blanchflower and Andrew Oswald. Figure 9.6 is a wage-setting curve estimated from data for the US. Note that in Figure 9.6, the horizontal axis shows the unemployment rate explicitly, falling from left to right. By using data on unemployment rates and wages in local areas, economists can estimate and plot the wage-setting curve for an economy. A wage-setting curve estimated for the US economy (1979–2013). Figure 9.6 A wage-setting curve estimated for the US economy (1979–2013). Estimated by Stephen Machin (UCL, 2015) from Current Population Survey microdata from the Outgoing Rotation Groups for 1979 to 2013. Referring back to Unit 6, provide a brief explanation of the shift in the wage-setting curve for each row in the table below, using a diagram to show the best response function and the wage-setting curve. For the second and third rows, give an example from a real-world workplace. Explain why a rise in the unemployment rate shifts the best response function but not the wage-setting curve. 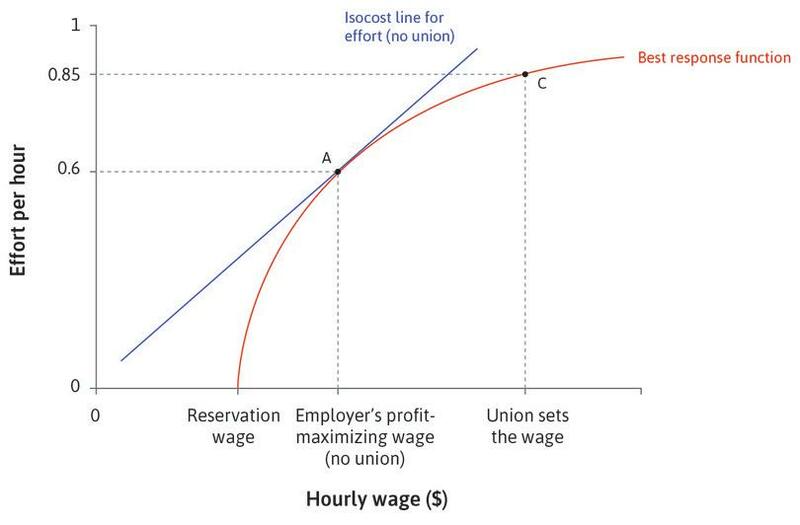 Figure 9.5 depicts the wage-setting curve and how it is derived using the best response function of the employees and the isocost lines for effort of the employers. A cut in the unemployment benefit would shift the best response function to the left, and raise the wage-setting curve. If the expected period of unemployment increased, it would shift the best response function to the right, raising the wage-setting curve. In a country where the stigma attached to unemployment is high, the wage-setting curve would be lower. A sudden drop in the working age population (due, for example, to the retirement of the baby-boomer generation) would shift the wage-setting curve lower. A cut in the unemployment benefit would shift the best response function to the left. However that would mean that the equilibrium wage falls for a given unemployment rate, and lower the wage-setting curve. An extended expected unemployment period would shift the best response function to the left, lowering the wage-setting curve. If there is high stigma attached to unemployment, then the workers’ best response functions would move to the left. This reduces the equilibrium wage for a given unemployment rate, resulting in a lower wage-setting curve. With the balance of job seekers and vacancies shifting in favour of the workers, their best response function would shift to the right, resulting in the wage-setting curve moving upwards. In order to understand the second component of the labour market model—the price-setting curve—we need to look more carefully at the firm’s decision about how many people to hire, and how this depends on the amount that it produces. The amount produced depends on the amount that the firm is able to sell, which in turn depends on the price that it charges. The firm’s decision comes from the interaction between the firm’s three departments. Recall in our model they are human resources (HR), the marketing department, and the production department (PD). Remember this firm has only one input—labour—so the wage is the only cost. And to make things even simpler, we assume that one hour of labour produces one unit of output (average product of labour = λ = 1). So the wage the firm pays (W) is the cost of a unit of output (in the relevant currency unit). Note that W is the nominal wage and w is the real wage. The process is summarized in the table in Figure 9.7. The three departments determine the firm’s hiring. Figure 9.7 The three departments determine the firm’s hiring. Once HR has set the wage at a level sufficient to motivate the workforce, the marketing department proceeds in two steps. Remember that the firm can set the price but not the quantity that it will be able to sell (quantity sold depends on the amount demanded at each price on the firm’s demand curve). So first, as in Unit 7, the marketing department asks: which combinations of p and q are feasible? These combinations are shown by the demand curve, which will depend on the amounts that other firms are producing, the prices they are setting, the wages they are paying, and other influences on the total level of demand for goods in the economy. As in Unit 7, maximum profits occur at point B, where the demand curve is tangent to an isoprofit curve. The marketing department thus sets a price p*, and calculates that it will be able to sell q* units of the goods. The firm’s profit-maximizing choice of price, quantity, and employment. Figure 9.8 The firm’s profit-maximizing choice of price, quantity, and employment. The maximum profits occur at point B where the firm’s demand curve is tangent to an isoprofit curve. 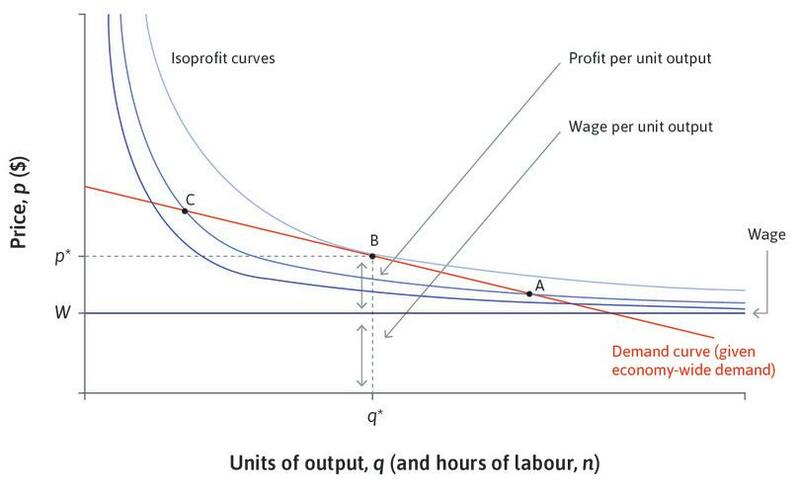 Figure 9.8a The maximum profits occur at point B where firm’s the demand curve is tangent to an isoprofit curve. This determines the division of the total revenue between profits and wages. Figure 9.8b This determines the division of the total revenue between profits and wages. When the firm sells q* goods at a price p*, its total revenue is p*q*. Notice from the figure that once the firm has set a price, it has determined the division of the total revenue between profits and wages. This is based on the markup (p − W)/p (or 1 − (W/p)). As you have seen from Unit 7, this is greater when the demand curve is less elastic, indicating less intense competition. The PD knows that each hour of a worker’s time (working at the speed they are motivated to work by their employment rent and the threat of termin­ation) produces a single unit of the good so it hires n* workers’ hours of labour, where n* = q*. This is the firm’s (very simple) production function. It will help in the next section to think about how the model explains what the firm would do if it found itself at a point like A. The marketing department would see that the firm was making lower profits because the isoprofit curve at A is lower than at point B. The marketing department would then raise the price and inform the PD that it should produce less. Similarly, if the firm were at point C, the marketing department would lower its price and the PD would get the message to produce more, to meet the higher sales at the lower price. 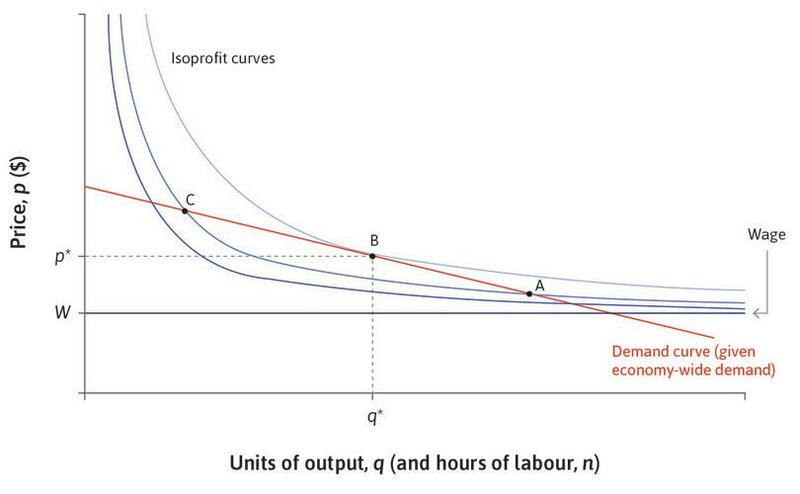 Figure 9.8 depicts the market’s demand curve and the firm’s isoprofit curves. Based on this information, which of the following statements is correct? The slope of the demand curve is the firm’s marginal rate of substitution. Between points A and C, the firm would prefer point A as the output is higher. Having chosen its profit-maximizing price p*, the firm would then set its nominal wage level. If the firm finds itself producing at point C, it can increase its profit by selling more units at a lower price. The firm’s marginal rate of substitution indicates how much the price can be lowered for an extra unit of sale while keeping the profit constant. This is therefore the slope of the isoprofit curve. Points A and C are on the same isoprofit curve. Therefore the firm would be indifferent between the two. The marketing department determines the price after HR determines the wage level. The profit-maximizing point is B, in which the firm produces more and charges less than at point C.
We have seen in Figure 9.8 that when the firm sets the price as a markup on its wage cost, this means that the price per unit of output is split into the profit per unit and the wage cost per unit (Figure 9.8). 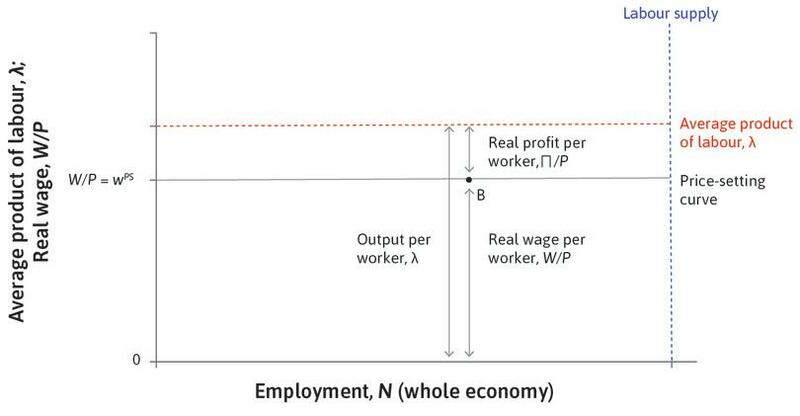 For the economy as a whole, when all firms set prices this way, output per worker (labour productivity, or equivalently, the average product of labour, called lambda, λ) is split into real profit per worker Π/P and the real wage W/P (Figure 9.9). Figure 9.9 shows the outcome of the price-setting decisions of firms in the whole economy and we use P to represent the economy-wide price level. The top horizontal line shows firms’ revenues per worker in real terms: the average product of labour. What we call the price-setting ‘curve’ is not really much of a curve: it is just a single number that gives the value of the real wage that is consistent with the markup over costs, when all firms set their price to maximize their profits. The value of the real wage consistent with the markup does not depend on the level of employment in the economy, so it is shown as in Figure 9.9 as a horizontal line at the height of wPS. Figure 9.9 The price-setting curve. Point B in Figures 9.9 and 9.10 on the price-setting curve shows the outcome of profit-maximizing price-setting behaviour of firms for the economy as a whole. Figure 9.10 The price-setting curve. Point A is above the price-setting curve, which means that the real wage is higher than is consistent with a firm’s profit maximizing markup. If the real wage is too high, it means the markup is too low. 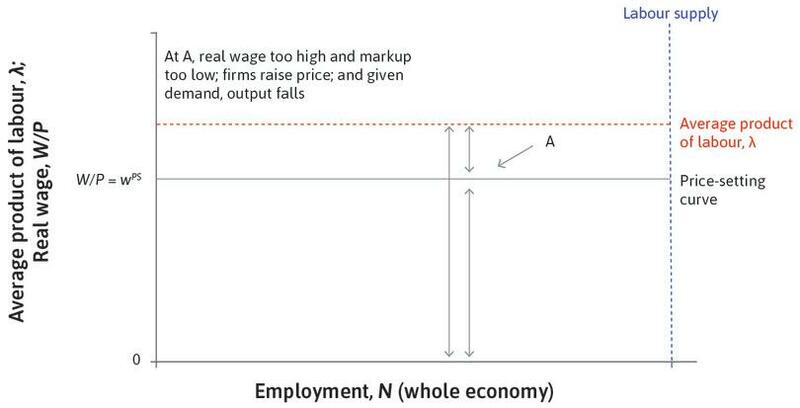 Figure 9.10a Point A is above the price-setting curve, which means that the real wage is higher than is consistent with a firm’s profit maximizing markup. If the real wage is too high, it means the markup is too low. The firm will raise its price so as to move towards higher profits at point B. The increased price will mean that fewer goods are sold, and as this is true of all firms, total employment falls. Figure 9.10b The firm will raise its price so as to move towards higher profits at point B. The increased price will mean that fewer goods are sold, and as this is true of all firms, total employment falls. Below the price-setting curve, at a point like C, firms lower their prices and hire more people. Figure 9.10c Below the price-setting curve, at a point like C, firms lower their prices and hire more people. Point B is the firm’s profit-maximizing price and profit margin. Given economy-wide demand, total profits are lower at A and C for firms facing the demand curve in Figure 9.8. Figure 9.10d Point B is the firm’s profit-maximizing price and profit margin. Given economy-wide demand, total profits are lower at A and C for firms facing the demand curve in Figure 9.8. Now think about point A in Figure 9.10, which corresponds to point A in Figure 9.8. Follow the steps in Figure 9.10 to see why the firm will raise its price so as to move towards higher profits at point B. The rise in price and the reduction in employment are indicated by the arrow at point A in Figure 9.10, which points down and to the left. It points down because the rise in prices implies a fall in the real wage, that is, the nominal wage divided by the price. It points left because a price increase implies a fall in output and employment. 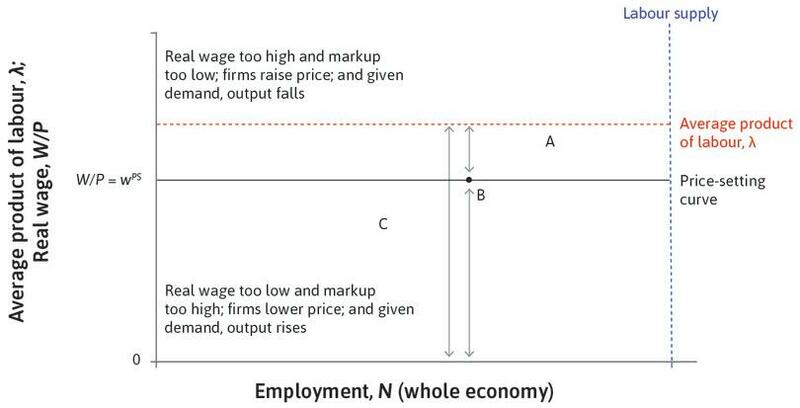 In your own words and using a diagram like Figure 9.8, explain why prices would fall and employment would increase if the economy were at point C in Figure 9.10 (the opposite of what happens at point A). In Figure 9.9, above the price-setting curve, like point A, firms raise prices and cut employment. Below the price-setting curve, at a point like C, firms lower prices and hire more people. Given the level of demand in the economy as a whole, firms’ pricing and hiring behavior will push the economy to a point on the price-setting curve so that the level of employ­ment and real wage are at a point like B. Competition: The intensity of competition in the economy determines the extent to which firms can charge a price that exceeds their costs, that is, the markup. The less the competition, the greater the markup. In Figure 9.8, a steeper demand curve, which results from less competition among firms, will lead to a higher markup and increase the profit per worker. Since this leads to higher prices across the whole economy, it implies lower real wages, pushing down the price-setting curve. Labour productivity: For any given markup, the level of labour productivity—how much a worker produces in an hour—determines the real wage. The greater the level of labour productivity (λ), the higher the real wage that is consistent with a given markup. In Figure 9.8, higher labour productivity shifts the dashed line upwards, and, keeping the markup un­changed, the price-setting curve will shift upwards, raising the real wage. To understand more about the price-setting curve, read the Einstein at the end of this section. The following diagram depicts the price-setting curve. Based on this information, which of the following statements is correct? At point A, the markup is too high, and therefore the firm will raise its price. This leads to lower demand for the good and hence lower employment towards B. At point C, the real wage is too low and the markup is too high. Therefore the firm is able to increase profit by lowering prices and hiring more workers. Higher competition implies a lower price-setting curve. For any given markup, higher labour productivity implies a lower price-setting curve, which means a lower real wage. At point A, the real wage is too high, which means that the markup is too low. The rest of the statement is correct. Point B is the profit-maximizing point. Therefore the firm is able to increase its profit by moving from C to B, by lowering its price (which reduces the markup and increases the real wage) and hiring more workers. Higher competition implies lower markup. This reduces the profit per worker. Since this leads to lower prices across the whole economy, it implies higher real wages, pushing up the price-setting curve. Higher labour productivity means a higher average product of labour curve. For any given markup this means a higher price-setting curve, which means a higher real wage. There are several steps to show how the price-setting curve for the economy as a whole results from the decisions of individual firms. To focus on what is essential, we assume the firm’s only costs are the wages it pays. (We are setting aside the opportunity cost of the capital goods which the workers use in producing the firm’s output.) We assume that on average a worker produces λ units of output, which does not vary with the number of workers employed. We use the Greek letter lambda (λ) for labour productivity. The firm pays the worker a wage W in dollars. Both labour productivity and wages can be measured per hour, per day or per year. In our numerical examples, we typically use hourly wages and productivity. For example: if W = $30 and λ = 10, then unit labour cost is $3, that is $30/10 units = $3 per unit. When the firm sets its profit-maximizing price, this splits output per worker into the part that goes to employees as wages and the part that goes to owners as profits. From the employee’s point of view, the real wage measures how much of her typical consumption she can purchase with an hour’s earnings. Since she buys many different goods and services, this depends on prices set by the firms throughout the economy, not just her own firm. We call the average price of the goods and services the worker consumes, P, which is an average of the different levels of p set by individual firms across the economy. The real wage is the nominal wage divided by the economy-wide price level, P.
This is the wage indicated by the price-setting curve. By superimposing the wage-setting curve on the price-setting curve in Figure 9.11, we have a picture of the two sides of the labour market. Equilibrium in the labour market. Figure 9.11 Equilibrium in the labour market. 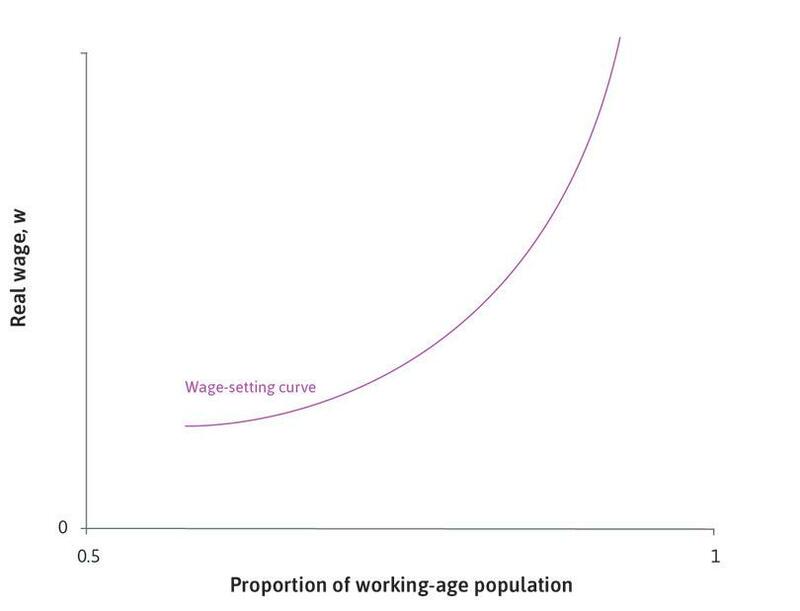 All of the points in the shaded area below the wage-setting curve are labeled ‘no work done’ because in this region the real wage is insufficient to motivate workers to work. In this situation, there is no work done and no profits, so nobody is hired: the only outcome possible in the long run if the real wage is below the wage-setting curve is zero employment. These shaded points are not feasible. The firms are offering the wage that ensures effective work from employees at least cost (that is, on the wage-setting curve). HR cannot recommend an alternative policy that would deliver higher profits. Employment is the highest it can be (on the price-setting curve), given the wage offered. The marketing department cannot recommend a change in price or output. Those who have jobs cannot improve their situation by changing their behaviour. If they worked less on the job, they would run the risk of becoming one of the unemployed, and if they demanded more pay, their employer would refuse or hire someone else. Those who fail to get jobs would rather have a job, but there is no way they can get one—not even by offering to work at a lower wage than others. We have shown that unemployment can exist in Nash equilibrium in the labour market. We now show why there will always be unemployment in labour market equilibrium, using the argument from Unit 6. This is called equilibrium unemployment. Unemployment means that there are people seeking work but not finding it. This is also termed excess supply in the labour market, meaning that demand for labour at the given wage is lower than the number of workers willing to work at that wage. To understand why there will always be unemployment in labour market equilibrium, we refer to the labour supply curve. In our model, we assume that the labour supply curve is vertical, meaning that higher wages do not lead more people to offer more hours at work. At higher wages some people seek (and find) more hours of work, and others seek (and find) shorter hours. You know from Unit 3 that the substitution effect of a wage increase (leading to the choice of more hours of work and less of free time) may be offset by the income effect. 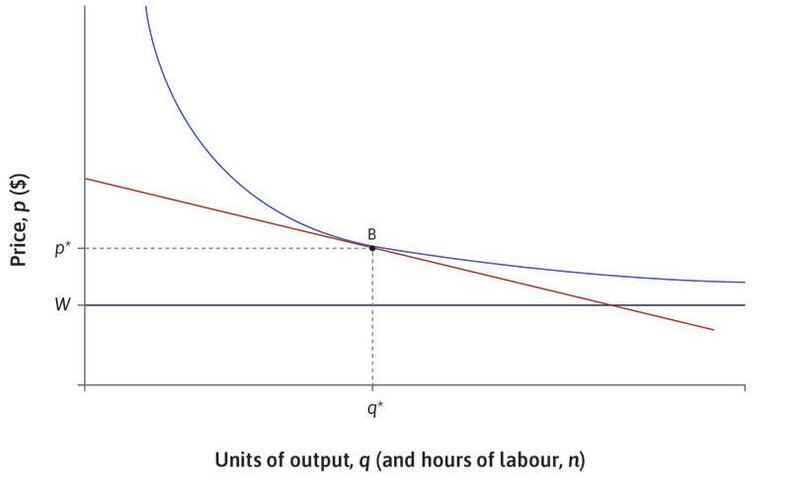 For simplicity we draw a supply curve such that the wage has no effect on the labour supply. But this is not important. The model would not be different if higher wages led to either more or fewer people seeking work. To see this, you can experiment with labour supply curves with different shapes in Figure 9.11. Why will there always be some involuntary unemployment in labour market equilibrium? If there was no unemployment: The cost of job loss is zero (no employment rent) because a worker who loses her job can immediately get another one at the same pay. Therefore some unemployment is necessary: It means the employer can motivate workers to provide effort on the job. 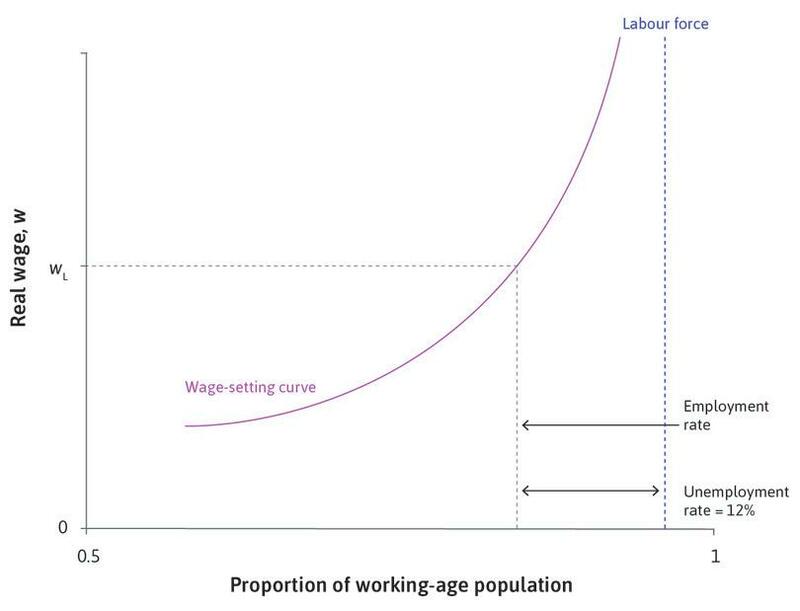 Therefore the wage-setting curve is always to the left of the labour supply curve. It follows that in any equilibrium, where the wage and price-setting curves intersect, there must be unemployed people: This is shown by the gap between the wage-setting curve and the labour supply curve. Another way to see this is to look again at Figure 9.11. Notice that the wage-setting curve rises steeply when it comes close to the labour supply line, exceeding both the price-setting and labour productivity curves. This fact about our model highlights an important limit on policies to reduce unemployment. According to our model, any policy that comes close to entirely eliminating unemployment would put employers in a position that the best they could do would be to pay wages so high they would eliminate the employers’ profits and drive the firms out of business. Exercise 9.4 Is this really a Nash equilibrium? In this model, the unemployed are no different from the employed (except for their bad luck). Imagine you are an employer, and one of the unem­ployed comes to you and promises to work at the same effort level as your current workers but at slightly lower wage. Does your reply help explain why unemployment must exist in a Nash equilibrium? Figure 9.11 depicts the labour market model. Consider now a reduction in the degree of competition faced by the firms. Which of the following statements is correct regarding the effects of reduced competition? The price-setting curve shifts up. The wage-setting curve shifts down. Decreased competition implies a higher markup. This decreases the share of output claimed by the workers, reducing their real wage. Hence the price-setting curve shifts down. The wage-setting curve is determined by the supply of labour. It is therefore unaffected. Decreased competition leads to a lower price-setting curve, while the wage-setting curve is unaffected. Therefore the equilibrium (the intersection of the two curves) shifts down and to the left, implying lower real wage and higher unemployment. 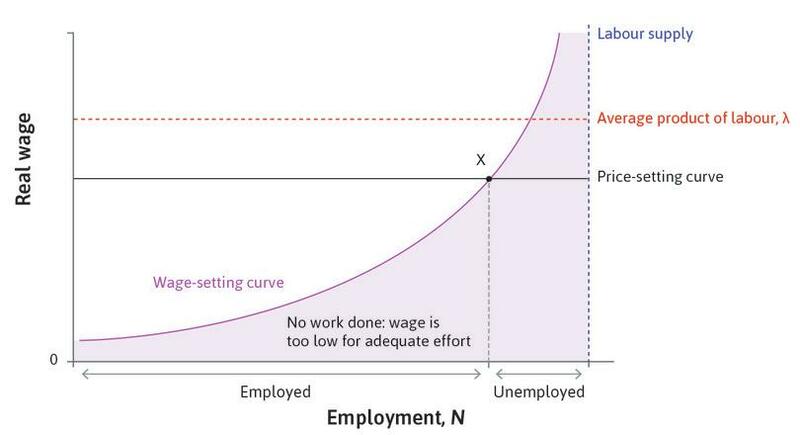 With the price-setting curve shifting down, the intersection of the two curves moves down the wage-setting curve to where there is higher unemployment. Which of the following statements is correct regarding the effects of a rise in the real wage on the labour supply of a worker? The income effect means that the worker will increase his labour supply. The substitution effect means that the worker will increase his consumption of free time. The income and substitution effects always enhance each other, leading to higher labour supply. At high wage levels, the income effect dominates the substitution effect, leading to lower labour supply. As the real wage rises, the worker feels richer. This would induce him to work less, in other words, the income effect is negative. The real wage is the price of consuming leisure. Therefore when the wage rises, free time becomes more expensive relative to consumption goods (which are purchased using the wage income). Hence the worker would substitute out of consuming leisure into consuming goods, implying lower free time and higher labour supply. The income and substitution effects always work against each other, leading to higher labour supply at lower wages and lower labour supply at higher wages. The negative income effect and the positive substitution effect always work against each other. At high wages the former more than offsets the latter, implying that the worker reduces his labour supply (he already earns enough). At the beginning of this unit, you read about the father and son working in the Australian minerals sector (Doug and Rob Grey). The boom and bust in their lives reflected changes in economic conditions in the Australian economy as a whole. The minerals boom had produced the large-scale construction of mining facilities in Western Australia, Queensland, and the Northern Territory. As construction was coming to an end on existing projects, global iron ore prices collapsed, with the result that new mines, ports and processing facilities were not started. In Figure 9.1, unemployment began to rise as the global price of iron ore plummeted. Unemployment increased because the demand for labour in mining and in the related service activities shrank. Not only did the demand for minerals fall off, but demand also declined for the goods and services that the Grey family and others like them would have purchased if they had kept their jobs. As a result, demand for goods and services fell across the economy, and with it the derived demand for labour. The term ‘derived demand for labour’ is used to highlight the fact that the firms’ demand for labour depends on the demand for their goods and services. Economists use the term aggregate—meaning added up to measure the whole, not just the parts—to describe economy-wide facts or variables. Aggregate demand, for example, is the sum of the demand for all of the goods and services produced in the economy, whether from consumers, firms, the government, or buyers in other countries. The increase in unemployment caused by the fall in aggregate demand is called ‘demand-deficient’ unemployment—or, as we shall learn in Unit 13, cyclical unemployment. How does this demand-deficient unemployment appear in our model of the labour market, and how does it relate to unemployment in the Nash equilibrium of the labour market? Follow the steps in Figure 9.12 to compare unemployment in the labour market equilibrium (at X) with the unemployment caused by a low level of aggregate demand (at B). An unemployed person at X is involuntarily unemployed because that person would accept a job at the real wage shown by the intersection of the wage and price-setting curves. An unemployed person at point B is also involuntarily unemployed. In fact, such a person would accept a job with a wage below the wage shown at B, and still be willing to work hard on the job. Equilibrium and demand-deficient (cyclical) unemployment. Figure 9.12 Equilibrium and demand-deficient (cyclical) unemployment. At X, unemployment is at its labour market equilibrium level. Someone losing a job at X is not indifferent between being employed and unemployed because they experience a cost of losing the job. 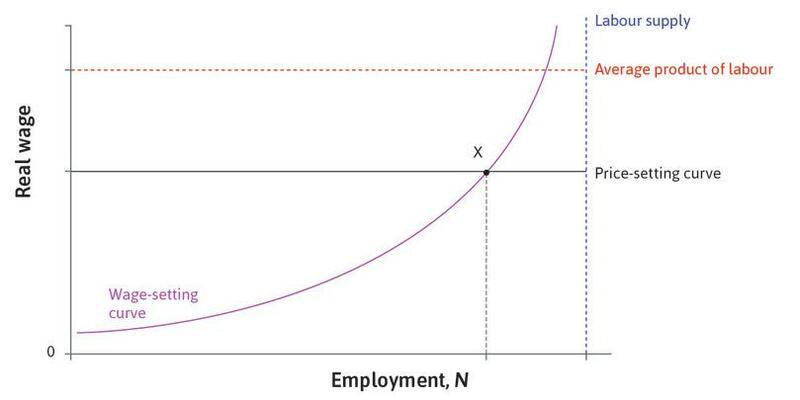 Figure 9.12a At X, unemployment is at its labour market equilibrium level. Someone losing a job at X is not indifferent between being employed and unemployed because that person experiences a cost of losing the job. At B, there are additional people looking for work who are also involuntarily unemployed. The additional unemployment at B is due to low aggregate demand and is called demand-deficient, or cyclical, unemployment. Figure 9.12b At B, there are additional people looking for work who are also involuntarily unemployed. The additional unemployment at B is due to low aggregate demand and is called demand-deficient, or cyclical, unemployment. At point B, total involuntary unemployment is given by the sum of cyclical and equilibrium unemployment. Point X is the Nash equilibrium of the labour market, which means that all actors are doing the best they can, given the actions of the other actors. No worker or firm can improve their position by changing their actions. Figure 9.12c At point B, total involuntary unemployment is given by the sum of cyclical and equilibrium unemployment. Point X is the Nash equilibrium of the labour market, which means that all actors are doing the best they can, given the actions of the other actors. No worker or firm can improve their position by changing their actions. We term the level of joblessness at point X equilibrium unemployment, but what about point B? Could high demand-deficient unemployment be a long-term outcome? Will the behaviour of firms and workers result in the disappearance of the unemployment caused by insufficient aggregate demand? We can see that B is not a Nash equilibrium. At this point the HR department—noting the high unemployment rate—would definitely say: ‘With such high unemployment, we could pay our workers much less and they would still do their work!’ Because the firm could make higher profits by lowering the wage, as long as it remained above the wage-setting curve, B is not a Nash equilibrium. But even so, an outcome such as B could persist for a long time, without public policies to expand employment. Lower wages would lower costs. The degree of competition facing the firm has not changed, so it would want to set a price to restore the profit-maximizing markup. Given the lower costs, firms would therefore cut prices. Because the demand curve facing the firm is downward-sloping they would sell more, expanding output and employment. Figure 9.13 shows the firm’s adjustment process. The wage is cut to the lower level by HR, and given the lower costs, the marketing department cuts the price to maximize profit. Firms would move to the right along their demand curve. Output and employment increase. To see where the firm’s price cutting will stop, think about the new iso­profit curves once the cost of hiring labour has declined. Remember from Unit 7 that as the cost (C) has fallen, at every point on the isoprofit curve is now at a higher profit level than was the case prior to the decline in wages. Importantly, it is also steeper than before. 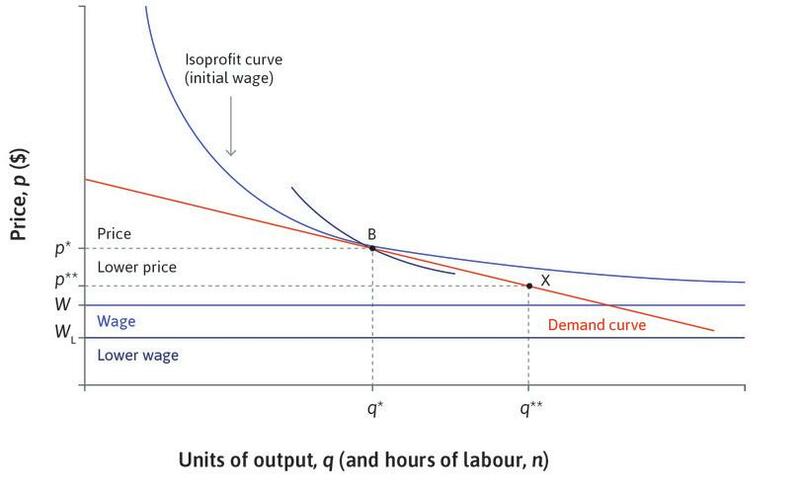 Recall that the slope of the isoprofit curve is (p − C)/q so that for example, at point B (q*, p*) the slope of the isoprofit curve with the lower wage is steeper. Follow the steps in Figure 9.13 to see where the firm will set its price. A firm raises output and employment following a cut in wages. Figure 9.13 A firm raises output and employment following a cut in wages. The new (lower wage) isoprofit curve passing through the original point B is now steeper than the demand curve, so the firm can do better by lowering its price and moving down the demand curve, selling more. 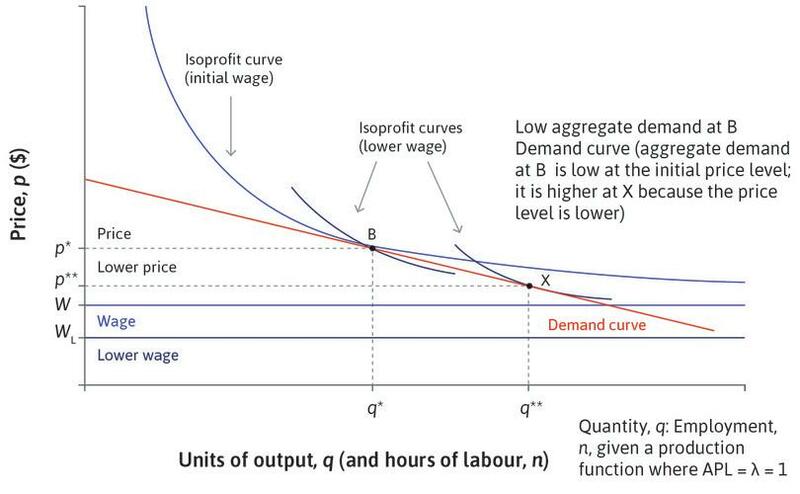 Figure 9.13a The new (lower wage) isoprofit curve passing through the original point B is now steeper than the demand curve, so the firm can do better by lowering its price and moving down the demand curve, selling more. It will continue doing this until it reaches a point on the demand curve where one of the new darker blue isoprofit curves is tangent to the demand curve. The firm maximizes profits at point X. Figure 9.13b It will continue doing this until it reaches a point on the demand curve where one of the new darker blue isoprofit curves is tangent to the demand curve. The firm maximizes profits at point X. This process explains how wage and price cutting might lead the economy to move from B back to X. But real economies do not function so smoothly.1 What could possibly go wrong? For the adjustment from B to X to occur, firms across the economy have to adjust wages and prices downward, and in response, firms and households have to increase their demand for goods and services by enough to restore economy-wide (or aggregate) demand to its level at point X. For the individual firm, a fall in price leads to higher sales. But falling prices across the economy can lead to cutbacks in spending, which shift the demand curves facing firms to the left. Falling prices can lead households to postpone spending, as they hope to get better bargains later. The gap in spending would be exacerbated by such behaviour. Moreover, as wages fall people may spend less, reducing demand. Thus, in the presence of deficient aggregate demand, the usual profit-seeking decisions of firms and the responses of consumers, when added up across the economy, cannot be guaranteed to move the economy from B to the Nash equilibrium at X.
Fortunately, there is another way to get from B back to the Nash equilibrium. 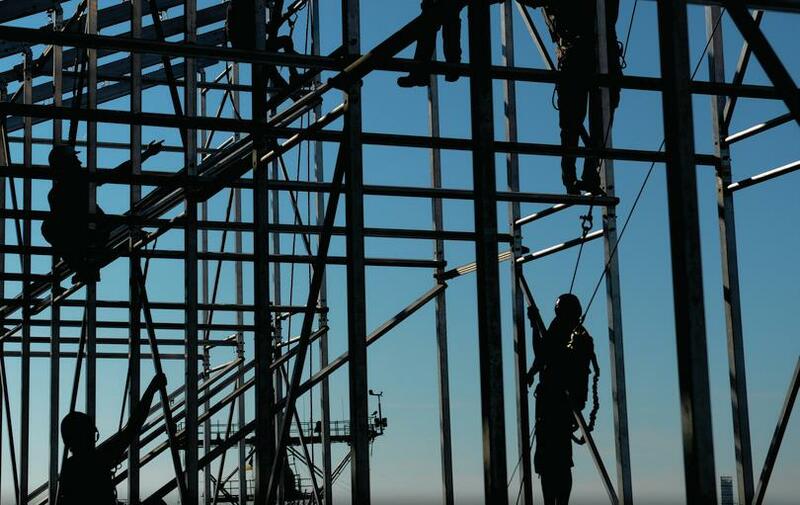 The government could adopt policies to increase its own spending and expand the demand facing the firms. In this case, at point B firms would find that they were producing less than the profit-maximizing amount and would employ more people, instead of wanting to reduce wages. Policies to affect the total demand in the economy are considered in Units 13–17. Figure 9.14 illustrates this case. As before, the economy begins (following the fall in economy-wide demand) at point B. Rather than either waiting for a revival in aggregate demand (for example, through a recovery in global demand for minerals) or waiting for the process of wage and price reductions to spread across the economy, the government can increase the level of aggregate demand. A firm raises output and employment following an increase in demand as a result of monetary or fiscal policy. Figure 9.14 A firm raises output and employment following an increase in demand as a result of monetary or fiscal policy. As before, the firm begins at point B. Figure 9.14a As before, the firm begins at point B. Remember, the isoprofit curves do not shift when the demand curve shifts. The firm moves on to a new higher isoprofit curve if demand rises as a result of higher economy-wide demand following monetary or fiscal policy actions. 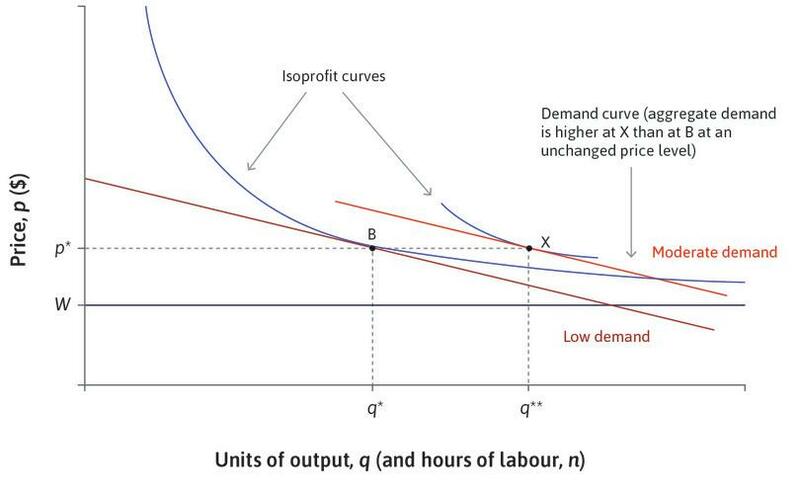 Figure 9.14b Remember, the isoprofit curves do not shift when the demand curve shifts. The firm moves on to a new higher isoprofit curve if demand rises as a result of higher economy-wide demand following monetary or fiscal policy actions. One method is for the central bank to make borrowing cheaper by reducing the interest rate. The aim is to provide incentives for people to bring forward some of their spending decisions, particularly on things that are often purchased with borrowed money such as housing and automobiles. We look closely at this monetary policy in Unit 10 (Banks, money and the credit market) and in Unit 15 (Inflation, unemployment and monetary policy). Other methods are for the government to increase its spending or reduce tax rates. These fiscal policies are the subject of Unit 14 (Unemployment and fiscal policy). We can summarize what we have learned in Figures 9.15 a–c. When aggregate demand in the economy is too low, unemployment is higher than at the Nash equilibrium. The government or central bank can eliminate this demand-deficient unemployment through fiscal or monetary policy. These policies are likely to be a more rapid way of reducing unemployment compared to solely relying on the combination of downward adjustment of wages and prices by firms throughout the economy and increased demand by households and firms for goods and services. The adjustment via fiscal or monetary policy is shown in Figure 9.15a, the adjustment via wage and price cuts is shown in Figure 9.15b, and the aggregate labour market is shown in Figure 9.15c. The firm: Adjustment to equilibrium unemployment at X via fiscal or monetary policy. Figure 9.15a The firm: Adjustment to equilibrium unemployment at X via fiscal or monetary policy. The firm: Adjustment to equilibrium unemployment at X via wage and price cuts. Figure 9.15b The firm: Adjustment to equilibrium unemployment at X via wage and price cuts. Aggregate labour market: cyclical and equilibrium unemployment. Figure 9.15c Aggregate labour market: cyclical and equilibrium unemployment. We saw that if an economy has low aggregate demand with high cyclical unemployment, then automatic adjustment back to equilibrium could occur through a process of wage and price cuts. Imagine you are a worker and you see that many workers have lost their jobs while other workers are having their wages cut. How might this affect your spending and saving decisions? How might this affect adjustment back to equilibrium? Figure 9.12 depicts the labour market when there has been a negative aggregate demand shock. Based on this information, which of the following statements is correct? The new equilibrium B is a Nash equilibrium. At B, unemployment is purely cyclical. At B, the firms are able to make higher profits by lowering the wage. The adjustment back from B to X is immediate. B is not a Nash equilibrium as the firms are able to make higher profits by lowering the wage. At B, total unemployment is the sum of equilibrium and cyclical unemployment. At B, the real wage is above the wage-setting curve, so firms are able to lower the wage and still make the workers work hard. This leads to higher profits. An outcome such as B after a negative aggregate demand shock can persist for a long time in the absence of public policies to expand employment. As we have seen, the labour market model determines not only the level of employment, unemployment, and the wage rate, but also the division of the economy’s output between workers (both employed and unemployed) and employers. So the labour market model is also a model of the distribution of income in a simple economy in which there are just these two classes (employers, who are the owners of the firms, and workers), where some of the latter are without work. As we did in Unit 5, we can construct the Lorenz curve and calculate the Gini coefficient for the economy in this model. Refer back to the Einstein in Unit 5 on the Lorenz curve and to the Einstein at the end of this section, which explain how to calculate the Gini coefficient with different kinds of information about a population. The distribution of income at labour market equilibrium. Figure 9.16 The distribution of income at labour market equilibrium. In the left panel of Figure 9.16 we show the labour market of an economy with 80 identical employees of 10 identical firms. As you can see, there are 10 unemployed people. Each firm has a single owner. The economy is in equilibrium at point A, where the real wage is both sufficient to motivate workers to work and consistent with the firm’s profit-maximizing price markup over costs (w = 0.6 in this case). The right-hand panel shows the Lorenz curve for income in this economy. Because the unemployed people receive no income if there are no unemploy­ment benefits, the Lorenz curve (the solid blue line) begins on the horizontal axis to the right of the left-hand corner. The price-setting curve in the left panel indicates that total output is divided up so that workers receive a 60% share and their employers receive the rest. In the right panel this is shown by the second ‘kink’ in the Lorenz curve, where we see that the poorest 90 people in the population (the 10 unemployed workers and the 80 employees, shown on the horizontal axis) receive 60% of the total output (on the vertical axis). 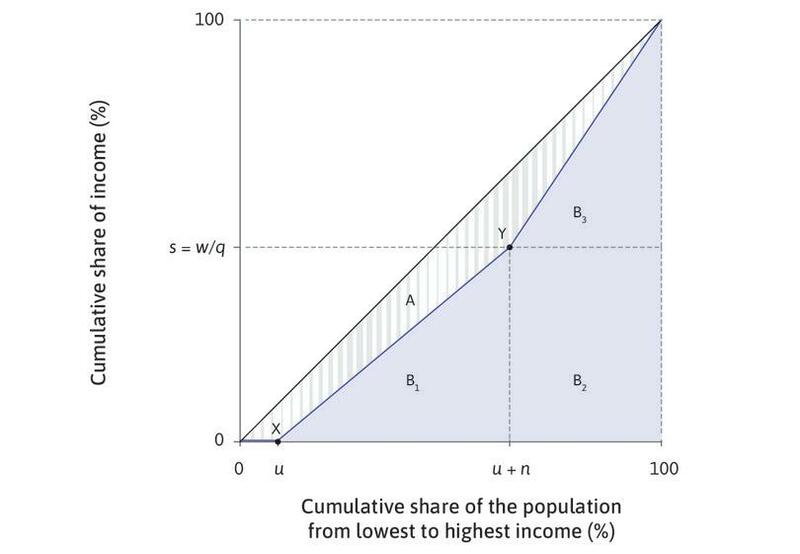 The size of the shaded area measures the extent of inequality, and the Gini coefficient is 0.36. To learn how to calculate the Gini coefficient from information like this see the Einstein at the end of this section. The Lorenz curve is made up of three line segments with the beginning point having coordinates of (0, 0) and the endpoint (1, 1). The first kink in the curve occurs when we have counted all the unemployed people. A larger fraction of the employees are without work (higher unemployment rate): The first kink shifts right. The real wage falls (or equivalently, the markup rises) and nothing else changes: The second kink shifts down. Productivity rises and nothing else changes (real wages do not rise): This implies that the markup rises, so again the second kink shifts down. What can change the level of employment and the distribution of income between profits and wages in equilibrium? Follow the steps in Figure 9.17 to see what would happen if there were an increase in the degree of competition faced by firms, perhaps as a result of a decrease in the barriers to firms from other countries competing in this economy’s markets. The effect of an increase in the extent of competition faced by firms: The price-setting curve shifts up and inequality falls. Figure 9.17 The effect of an increase in the extent of competition faced by firms: The price-setting curve shifts up and inequality falls. We start from the equilibrium at A with a Gini coefficient of 0.36. Suppose that the degree of competition faced by firms is increased. Figure 9.17a We start from the equilibrium at A with a Gini coefficient of 0.36. Suppose that the degree of competition faced by firms is increased. The markup charged by firms in the market will decrease, and so the price-setting curve will be higher. The new equilibrium is at B. Figure 9.17b The markup charged by firms in the market will decrease, and so the price-setting curve will be higher. The new equilibrium is at B. At the new equilibrium there is a higher wage and a higher level of employ­ment. Stronger competition means that firms have weaker market power: the share going to profits falls, and the share going to wages rises. Inequality falls: the new Gini coefficient is 0.19. Figure 9.17c At the new equilibrium there is a higher wage and a higher level of employ­ment. Stronger competition means that firms have weaker market power: the share going to profits falls, and the share going to wages rises. Inequality falls: the new Gini coefficient is 0.19. The markup would decrease, and as a result the real wage shown by the price-setting curve would increase, leading to a new equilibrium at point B with a higher wage and a higher level of employment. The share of output going to profits falls, and the share going to wages rises. Figure 9.16 is the Lorenz curve associated with a particular labour market equilibrium. In a population of 100, there are 10 firms, each with a single owner, 80 employed workers, and 10 unemployed workers. The employed workers receive 60% of the total income as wages. The Gini coefficient is 0.36. In which of the following cases would the Gini coefficient increase, keeping all other factors unchanged? A rise in the unemployment rate. A rise in the real wage. A rise in the workers’ productivity while the real wage is unchanged. A rise in the degree of competition faced by the firms. A rise in the unemployment rate would shift the first kink of the Lorenz curve to the right. This shifts the curve down, increasing the Gini coefficient. A rise in the real wage would raise the second kink of the Lorenz curve. This shifts the curve up, decreasing the Gini coefficient. This implies a rise in the markup, or equivalently, a fall in the wage share in total income. This shifts the second kink of the Lorenz curve downwards, increasing the Gini coefficient. A rise in the degree of competition would raise the price-setting curve in the model of the labour market, resulting in higher employment and higher wage share. This shifts the first kink of the Lorenz curve to the left and the second kink upwards, reducing the Gini coefficient. If the class of employers gets relatively smaller: Then u + n rises. This implies that g rises, and point Y shifts right on the Lorenz curve: inequality goes up. This is because the same amount of profit is divided among fewer people, so they are even richer than before. This could depict the early evolution of capitalism from an economy of smallish family-owned firms and manufacturers, each employing a few workers, to a modern economy with concentrated wealth. An increase in the wage share w/q, ceteris paribus, will reduce the Gini coefficient: This shifts point Y upwards. If all firms are cooperatives: If there are no employers and the workers keep all that they produce (w/q = 1), then the Gini coefficient declines to g = 2u + n – 1 and point Y moves to the top right corner. If in addition there is no unemployment, then u = 0 and n = 1, so g = 0: there is perfect equality because everyone is a worker receiving an identical wage. This assumes productivity remains unchanged. As we saw in the Einstein in Unit 5, this calculation does not work if the population is small: In this case the formula we derived for the Gini coefficient does not equal 1 when a single person receives all of the income—as it should. To show this, suppose that w = 0, so the only income goes to the employers. Then in our formula above g = u + n. Now imagine that there are 10 people in the population, just one of whom is the employer. Then g = 0.9 when the Gini is really equal to 1. This is the small population bias. If you calculate the Gini coefficient by taking differences among pairs of people in the population, your result for g will not be subject to this small population bias. Alternatively, you can multiply the g calculated above by N/(N − 1) to correct the bias, where N is the size of the population: multiplying 0.9 by 10/9 gives g = 1. Even though the supply of labour must always exceed demand for labour at the labour market equilibrium (there is always some involuntary unemployment), the supply of labour is still one of the important determinants of this Nash equilibrium. To see why this is so, imagine that there is immigration of people looking for employment (assume these immigrants are potential employees, as opposed to people who intend to start up a business), or that people who have stayed at home to raise children, or have retired, re-join the labour force. This process is true for any point on the wage-setting curve, so it must be true of the entire curve. Therefore, the effect of an increase in labour supply is to shift the wage-setting curve downward. We use an increase in the labour supply due to immigration as an example. 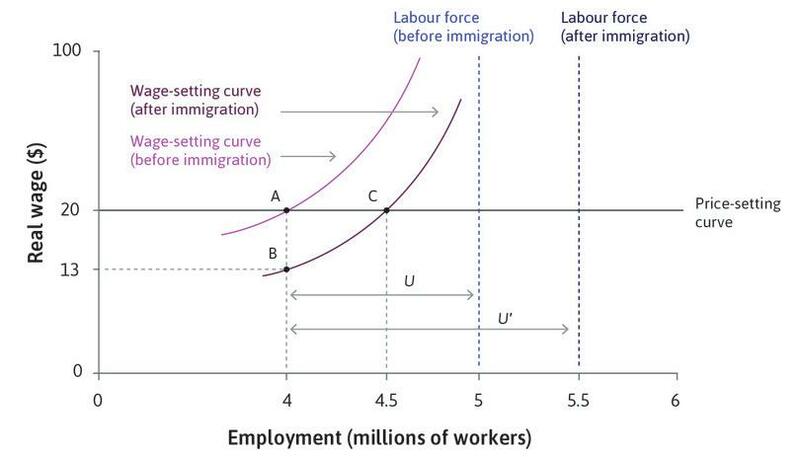 The labour supply curve would shift to the right, as shown in Figure 9.18. The effect of immigration on unemployment. Figure 9.18 The effect of immigration on unemployment. The economy starts at point A, employing 4 million workers at a wage of $20 per hour and a labour force of 5 million. Figure 9.18a The economy starts at point A, employing 4 million workers at a wage of $20 per hour and a labour force of 5 million. This is shown by the distance U. Figure 9.18b This is shown by the distance U. This increases the labour force from 5 million to 5.5 million workers. Figure 9.18c This increases the labour force from 5 million to 5.5 million workers. At any level of employment there are now more unemployed workers. The rise in unemployment to 1.5 million is shown by distance U′. The threat of job loss is greater and firms can secure effort from the workforce at a lower wage. Figure 9.18d At any level of employment there are now more unemployed workers. The rise in unemployment to 1.5 million is shown by distance U′. The threat of job loss is greater and firms can secure effort from the workforce at a lower wage. The wage is now set at point B on the wage-setting curve in the figure, with the wage at $13 an hour and employment still at 4 million. Figure 9.18e The wage is now set at point B on the wage-setting curve in the figure, with the wage at $13 an hour and employment still at 4 million. This causes firms to hire more workers, which requires rising wages along the wage-setting curve. The labour market moves from point B to point C.
Figure 9.18f This causes firms to hire more workers, which requires rising wages along the wage-setting curve. The labour market moves from point B to point C.
They rise until they reach the price-setting curve, meaning profits are consistent with market competition again. At point C, employment is 4.5 million workers, the wage is $20, and unemployment has fallen back to 1 million workers, as shown by distance U″. Figure 9.18g They rise until they reach the price-setting curve, meaning profits are consistent with market competition again. At point C, employment is 4.5 million workers, the wage is $20, and unemployment has fallen back to 1 million workers, as shown by distance U″. In this story, the short-run impact of immigration is bad for existing workers in that country: wages fall and the expected duration of unemploy­ment increases. In the long run, however, the increased profitability of firms leads to expanded employment that eventually (if no further changes take place) will restore the real wage and return the economy to its initial rate of unemployment. As a result, incumbent workers are no worse off. Immigrants are likely to be economically better off too—especially if they left their home country because it was difficult to make a living. The shift downward in the wage-setting curve at the initial level of employment lowered the wage (to B). The reduction in the wage results in a reduction in the firms’ marginal costs and with no change in the firm’s demand conditions, the firms will hire additional workers. As a result, employment expands so that once again the economy is at the intersection of the price-setting curve and the new wage-setting curve, with higher employment. The increase in labour supply leads to a new equilibrium at higher employment because it shifts the wage-setting curve down. New hiring stops when the wage is once again at the level shown by the price-setting curve (at C). In the new equilibrium, employment is higher and the real wage is unchanged. Suppose that some of the immigrants to the country decide to set up businesses, rather than become employees. Explain how you expect this to affect the wage-setting curve, the price-setting curve, and the labour market equilibrium. Figure 9.16 depicts the model of a labour market where there are 90 million workers. The current labour market equilibrium is at A. Now consider the case where the total labour supply is increased to 100 million. Based on this information, which of the following statements are correct regarding the adjustment process in the labour market? Higher unemployment results in a reduction in the employment rent enjoyed by workers employed at the current wage. The firms are required to raise wages to induce workers to work hard. The wage-setting curve shifts downward. Before the labour supply increase there are 10 million unemployed. With the extra 10 million workers joining the labour supply, unemployment initially doubles to 20 million workers. Higher unemployment means that it is more costly for the workers to be unemployed. Therefore there is an increase in the employment rent enjoyed by those employed. Higher unemployment implies higher employment rent. This means that firms are able to pay a lower wage and can still induce workers to work hard. Higher unemployment implies higher employment rent. This means that firms are able to pay a lower wage and can still induce workers to work hard. This is true of any point on the wage-setting curve, and therefore the wage-setting curve shifts downward. 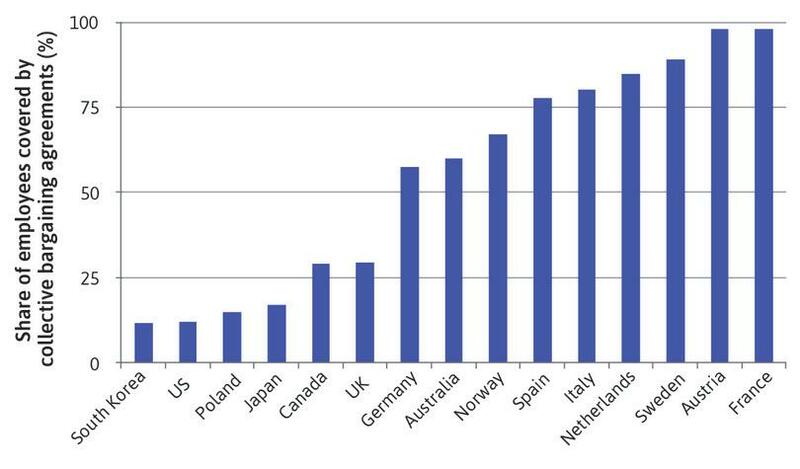 As you can see from Figure 9.19, the fraction of the workforce employed under collective bargaining agreements negotiated by labour unions varies greatly across countries, from virtually all workers in France and some northern European economies, to hardly any in the US and South Korea. Share of employees whose wages are covered by collective bargaining agreements (early 2010s). Figure 9.19 Share of employees whose wages are covered by collective bargaining agreements (early 2010s). Jelle Visser. 2015. ‘ICTWSS Data base. version 5.0.’. Amsterdam: Amsterdam Institute for Advanced Labour Studies AIAS. Updated October 2015. Where workers are organized into trade unions, the wage is not set by HR but instead is determined through a process of negotiation between union and firm. Although the wage must always be at least as high as the wage indicated by the wage-setting curve for the given level of unemployment, the bargained wage can be above the wage-setting curve. The reason is that now the employer’s threat to dismiss the worker is not the only exercise of power that is possible. The union can threaten to ‘dismiss’ the employer (at least temporarily) by going on strike, that is, withdrawing the employees’ labour from the firm. We can think of a ‘bargaining curve’ lying above the wage-setting curve, which indicates the wage that the union-employer bargaining process will produce for every level of employment. The relative bargaining power of the union and the employer determ­ines how much this bargaining curve lies above the wage-setting curve. The union’s power depends on the ability to withhold labour from the firm, so its bargaining strength will be greater if it can ensure that during a strike, no other workers will offer their services to the firm. This and the other determinants of bargaining power depend on the laws and social norms that are in force in an economy. In many countries, for example, it is a serious violation of a social norm among workers to seek employment in a firm whose workers are on strike. A powerful union, however, may not choose to raise the wage even if it has the power to do so. This is because even a very powerful union can only set the wage, and it cannot determine how many people the firm hires. Too high a wage may squeeze profits sufficiently to lead the firm to close down, or cut back on employment. Unions may choose to restrain their use of bargaining power. If their wage-setting covers a substantial part of the economy, they will take into account the effect of their wage decision on the wages and employment of workers in the economy as a whole. The union sets the wage. The employer informs workers that insufficient work will result in job termination. Employees respond to the wage and the prospect of dismissal by choosing how hard to work. 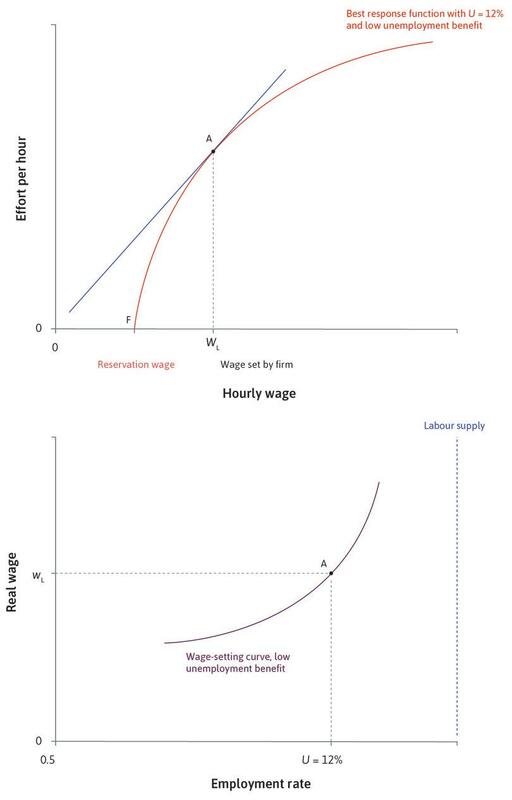 In this case, the employer no longer sets the wage that maximizes profits (the point of tangency of the isocost line for effort and the best response curve at point A in Figure 9.20). Use the steps in Figure 9.20 to see what happens when the union rather than the firm sets the wage. The union sets the firm’s wage. Figure 9.20 The union sets the firm’s wage. At point A, the employer sets the wage that maximizes profits at the point of tangency of the isocost line and the best response function. Figure 9.20a At point A, the employer sets the wage that maximizes profits at the point of tangency of the isocost line and the best response function. … but profits would be lower (indicated by the flatter isocost line passing through C). Figure 9.20c … but profits would be lower (indicated by the flatter isocost line passing through C). As shown in the figure, the wage will be higher than that preferred by the employer. Workers will now be working harder, but wages increase by more than productivity, so firms receive less effort for each dollar spent on wages. It follows that profits will be lower than without the union, that is, on the flatter isocost line passing through C.
By translating Figure 9.20 to the model of the labour market in Figure 9.21, we see that the bargained wage-setting curve lies above the wage-setting curve. Looking at the equilibrium where the bargained wage-setting curve intersects with the price-setting curve, the wage is unaffected, but the level of employment is lower. 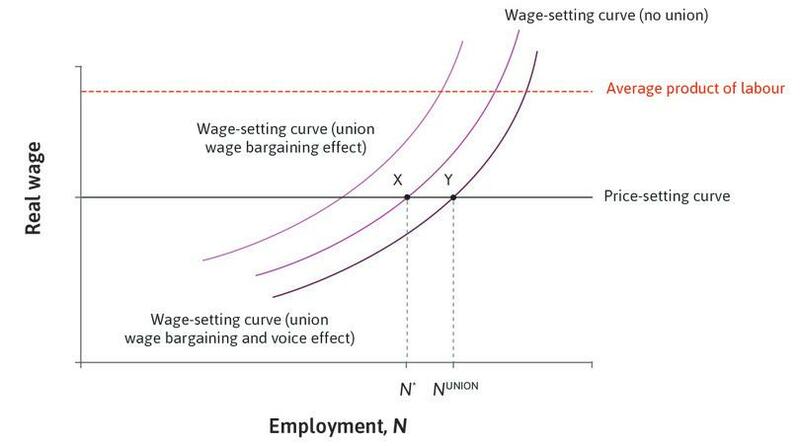 The bargained wage-setting curve when there is no union voice effect. 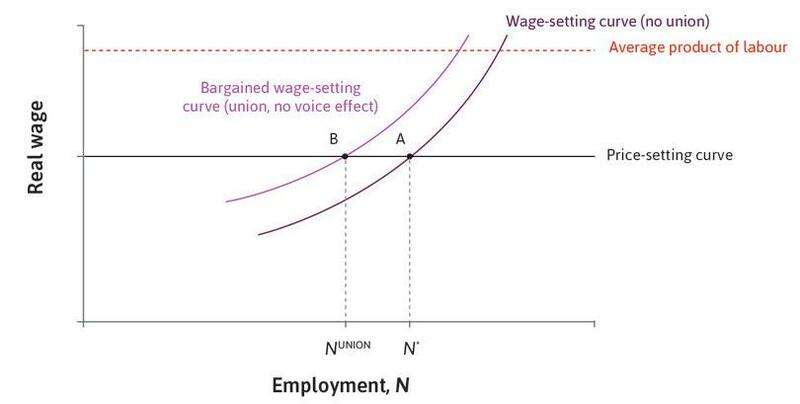 Figure 9.21 The bargained wage-setting curve when there is no union voice effect. Paradoxically, it seems that the union’s success in bargaining would harm workers, since the real wage is unchanged and more people are out of work. But if we look at the data on union bargaining coverage and unemployment in Figure 9.22, it does not seem to be the case that unemployment is higher in countries where union bargains are important in wage-setting. Austria, with almost all employees covered by union wage bargains, has a lower unemployment rate (averaged over 2000–2014) than the US, where fewer than one in five workers are covered by union contracts. Spain and Poland both had massive unemployment over this period, but union coverage was very high in Spain and very low in Poland. Collective wage bargaining coverage and unemployment across the OECD. Figure 9.22 Collective wage bargaining coverage and unemployment across the OECD. So the fact that unions can push up the wage-setting curve to the new ‘bargained wage-setting curve’ must not be the entire story. Suppose that over time, the employer and the trade union had developed a constructive working relationship—for example, solving problems that arise in ways that benefit both employees and the owners. The employees may interpret the employer’s recognition of the trade union, and its willingness to compromise with them over a higher wage, as a sign of goodwill. As a result, they might identify more strongly with their firm and experience effort as less of a burden than before, shifting their best response curve in Figure 9.23 up. The result of the greater bargaining power of the workers, and their reciprocation of the company’s worker-friendly policy, is shown as point D in the Figure 9.23. The wage is the same as in the previous case but because worker effort is higher, the firm’s profits are higher. Note that in the example shown, the firm is still worse off than it was in the absence of the union. With the new best response function, there is of course an outcome for a wage-setting firm that is even better than D—where the isocost curve is tangent to it (not shown). However, this is not feasible. The workers will not exert the higher effort in the absence of the negotiations about wages and conditions opened up by the union’s role in wage-setting. Union sets the firm’s wage and employees reciprocate. Figure 9.23 Union sets the firm’s wage and employees reciprocate. 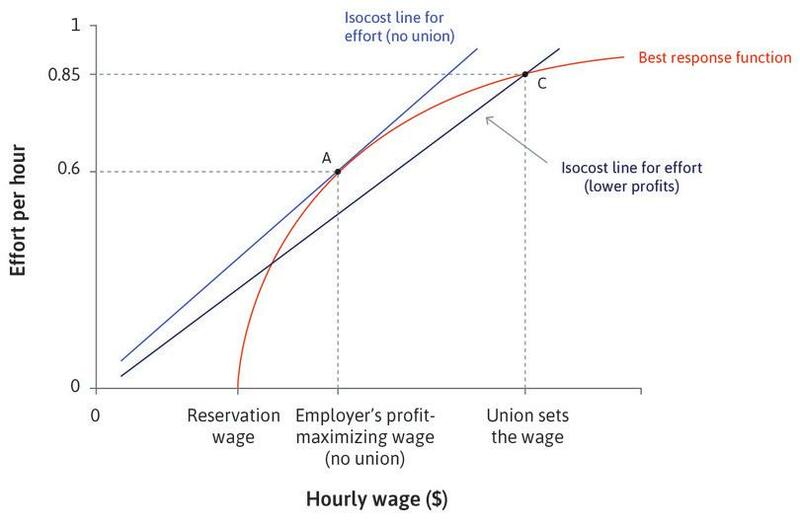 At point A, the employer sets the wage that maximizes profits at the point of tangency of the isocost line and the best response curve. 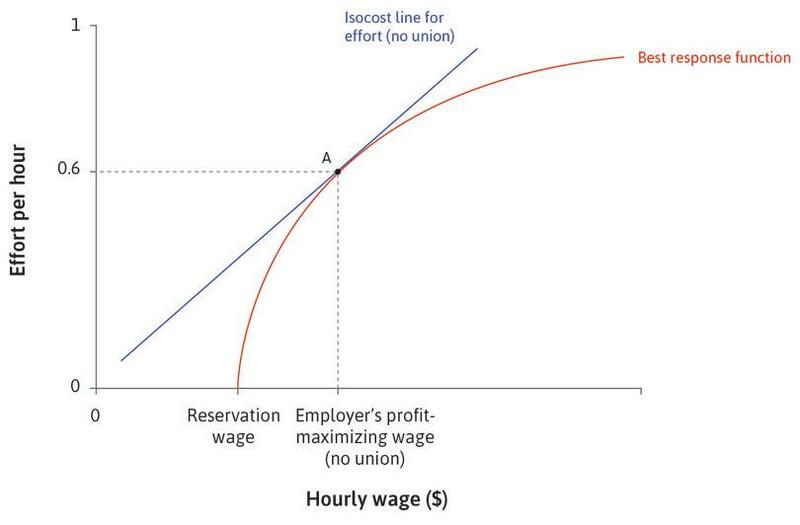 Figure 9.23a At point A, the employer sets the wage that maximizes profits at the point of tangency of the isocost line and the best response curve. If the employees interpret the employer’s recognition of the trade union, and its willingness to compromise with them over a higher wage, as a sign of goodwill, the best response curve shifts up. 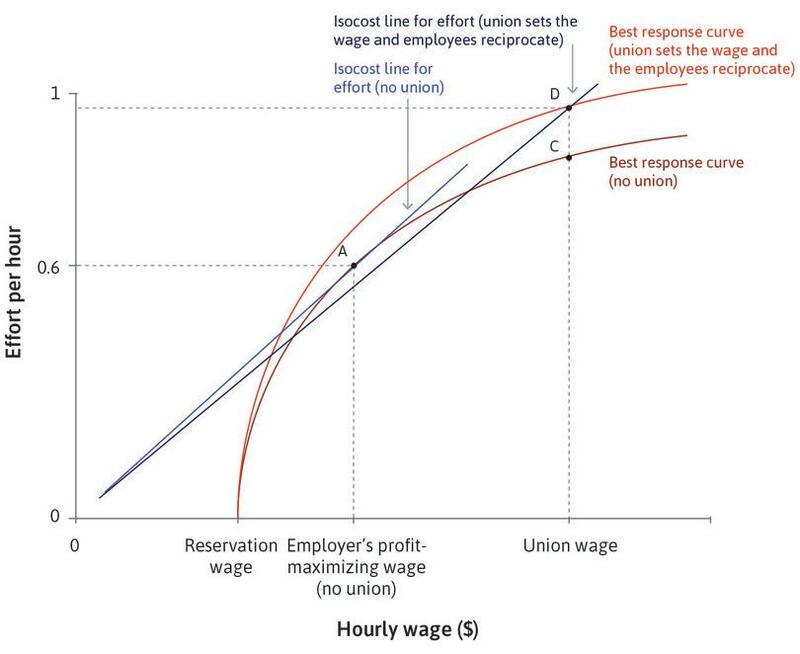 Figure 9.23b If the employees interpret the employer’s recognition of the trade union, and its willingness to compromise with them over a higher wage, as a sign of goodwill, the best response curve shifts up. The result of the greater bargaining power of the workers, and their reciprocation of the company’s worker-friendly policy, is shown as point D.
Figure 9.23c The result of the greater bargaining power of the workers, and their reciprocation of the company’s worker-friendly policy, is shown as point D.
It may be able to get the firm to pay a wage greater than the minimum necessary to induce the employees to work (the bargaining curve is above the wage-setting curve). Providing employees with both recognition and a voice in how decisions are made may lower the disutility of effort and thus reduce the lowest wage necessary to motivate employees to work effectively. The two effects are illustrated in Figure 9.24. In this figure, we show the case in which the equilibrium level of employment is higher and unemployment lower with the union (point Y) than without (point X). This is because the second effect (called the ‘union voice effect’) that shifts the wage-setting curve down was greater than the bargaining effect that shifts the wage-setting curve up. The bargained wage-setting curve and labour market equilibrium when there is a union voice effect. 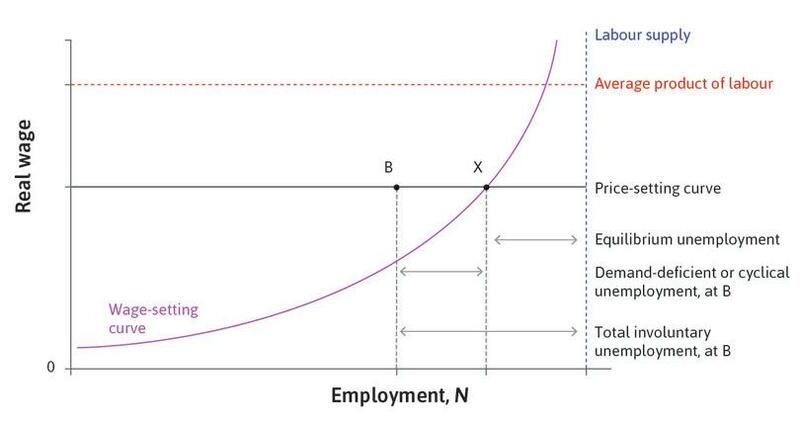 Figure 9.24 The bargained wage-setting curve and labour market equilibrium when there is a union voice effect. But it could have worked out the other way around. The bargained wage effect could have been greater than the union voice effect, in which case the effect of unions would have been to reduce employment in the labour market equilibrium. This provides a reason why the data in Figure 9.22 do not show any clear correlation (either positive or negative) of the extent of union contracts and the amount of unemployment. Unions may also affect the average productivity of labour, which will shift the price-setting curve. If unions foster cooperation with management in solving production problems, average product and the price-setting curve will rise (leading to higher wages and less unemployment). If unions resist productivity improvements such as the introduction of new machinery or changes in work rules, then the effect will go in the opposite direction. Figure 9.20 depicts the effect of union wage-setting. What can we conclude from this figure? Compared to A, at C the effort per hour is higher and therefore the firm’s profit is higher. The resulting bargained wage-setting curve will be above the wage-setting curve with no union. The effect of a strong union will always be to increase unemployment. Under union wage-setting, the firm is still setting the wage that maximizes its profits. The isocost line is flatter through C than through A. This means that the firm receives less effort from workers for each dollar spent on wages. Therefore the firm’s profit is lower at C.
Due to the union effect, employees need to be paid a higher wage to work hard, compared to when there is no union. This shifts the wage-setting curve higher. If the employees reciprocate (for example when they have a lower disutility of effort) and there is a ‘union voice effect’, then this has an effect of shifting the wage-setting curve downward. If this more than offsets the wage bargaining effect that shifts the wage-setting curve up, then there will be an overall decrease in unemployment. Unlike at A, at C the firm is not producing at the point of tangency between the isocost line and the best response curve. Therefore it is no longer setting the profit-maximizing wage level. Like when we studied the effect of taxes on prices and quantities of goods in Unit 8, we now use the labour market model we have constructed (the two curves) to see how a policy change will shift one or both of these curves. The effect of a policy is determined by how it changes the point of intersection of the two curves. The objectives of labour market policies typically include reducing unem­ployment and raising wages (particularly of the least well off). Later (in Units 13–16) we will see that other objectives include reducing the economic insec­urity to which families are exposed because of periods of unemployment. Consider an improvement in the quality of education and training that future employees receive, which increases the productivity of labour. What is the effect of this productivity increase on real wages and equilibrium employment? The markup chosen by the firm when it sets its price to maximize its profits is determined by the amount of competition that the firm faces, so it is unaffected by the increase in productivity. This markup determines the distribution of the firm’s revenue between the employees and the owners, and so this has not changed either—wages remain the same fraction of revenue. So since the firm’s output per worker has risen, real wages and the price-setting curve must also rise. The outcome is a rise in both equilibrium employment and the real wage. A policy that has been advocated to increase employment is a subsidy paid to firms in proportion to the wages it pays its workers. For example, suppose that hiring a worker for an hour would cost the firm $40 in wages, but it would receive a 10% subsidy of that amount from the government, or $4. So the net wage cost to the firm would now be $36. How would this affect the price-setting curve? The costs of the firm have now fallen, but as above, the optimal markup that the firm will use to determine its price has not changed, so the firm will lower its price to restore the old markup. When all firms do this, the prices of goods that the worker consumes fall, and real wages rise. The effect, as above, is to shift upwards the price-setting curve. In both cases—education and training or a wage subsidy—the effect is to move the new labour market equilibrium up and right along with wage-setting curve to both higher wages and greater employment in the economy as a whole. The full effect of each of these policies would have to take account of how the education and training or the wage subsidy were financed, but to allow a simple illustration of how the model works here, we assume that the funds necessary for these programs could be raised without affecting the labour market. 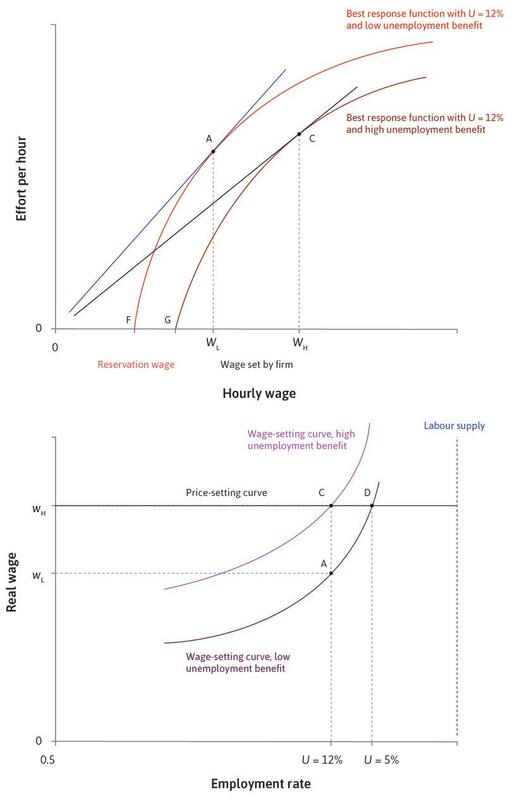 An example of how economic policy affects the wage-setting curve is shown in Figure 9.25. Throughout this example, the unemployment rate is held constant at 12% and we vary the unemployment benefit to which the worker is entitled. A higher unemployment benefit increases the reservation wage and shifts the best response curve to the right: the higher reservation wage at a higher unemployment benefit level is shown by point G. The employer sets a higher wage (point C). Work through the steps to see what happens to the wage-setting curve and unemployment. Deriving the wage-setting curve: Varying the unemployment benefit level in the economy. Figure 9.25 Deriving the wage-setting curve: Varying the unemployment benefit level in the economy. When unemployment is 12%, and the unemployment benefit is low, the firm sets the wage at point A in the upper panel, which corresponds to point A in the lower panel. Figure 9.25a When unemployment is 12%, and the unemployment benefit is low, the firm sets the wage at point A in the upper panel, which corresponds to point A in the lower panel. There is a new wage-setting curve, which goes through point C.
Figure 9.25b There is a new wage-setting curve, which goes through point C.
We introduce the price-setting curve to find the labour market equilibrium. With the low unemployment benefit the equilibrium unemployment rate is 5% at D, but with the higher unemploy­ment benefit the rate rises to 12% at C.
Figure 9.25c We introduce the price-setting curve to find the labour market equilibrium. 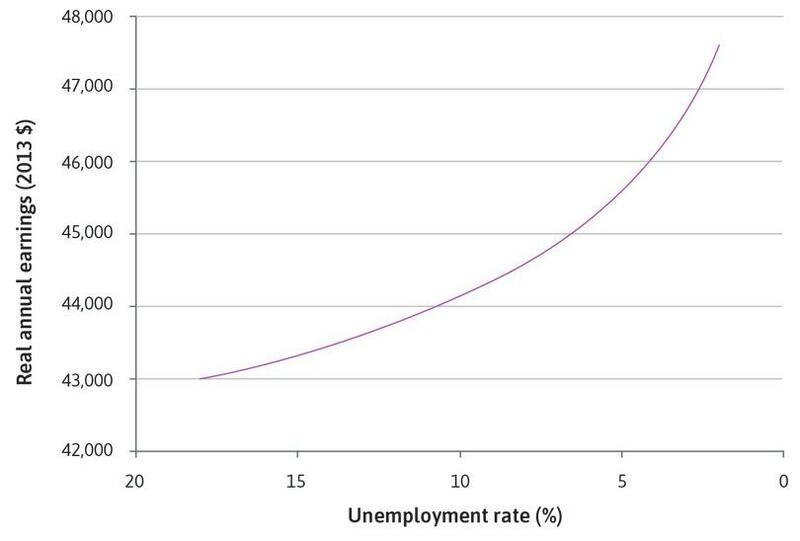 With the low unemployment benefit the equilibrium unemployment rate is 5% at point D, but with the higher unemployment benefit the rate rises to 12% at point C.
There are policies that would affect the third curve in the figure (the labour supply curve). We have already seen how immigration policies could affect the supply of labour and hence the workings of the labour market. Other policies affecting the supply of labour include policies to enhance women’s employment opportunities such as subsidized childcare, and a reduction in discrimination against disadvantaged minorities. These policies work initially by increasing the pool of people without jobs and therefore shifting downwards the wage-setting curve, as in the case of immigration. Its functioning is very important for how well the economy serves the interests of the population. It is different enough from the way that many familiar markets work that it is essential to know these differences to understand how the economy works. A good way to review these differences is to contrast the market for bread that we used to illustrate the model of a competitive equilibrium of price takers in the previous unit with the market for, say, baristas (which, for readers unfamiliar with Italian-inspired coffee shops, are those who make espresso-based coffee drinks). No buyer could benefit from offering to pay less than the prevailing price: No bakery would agree to the sale. No buyer could benefit by offering to pay more than the going price: This would just be throwing away money. Buyers in the bread market are price-takers because they wish to purchase bread at the lowest possible price. No seller (a bakery) could benefit from setting a higher price: There would be no customers. No seller could benefit by offering a lower price: This would be throwing away money. They can have as many customers as they like at the existing price. Now think about a buyer in the labour market. This is an employer who buys the employee’s time. The price is the wage. An employer who acts like a bread-buyer would offer the employee the lowest wage that the individual would accept to take the job. This lowest possible wage is the reservation wage. We know from Unit 6 that an employer who did this would be disappointed. The worker who is paid just a reservation wage does not worry about losing the job, and so would have little incentive to work hard for the employer. Instead, we saw that employers choose a wage to balance their wage costs against the positive effects that a higher wage has on the employee’s motivation to work. In the bread market, the sales contract between buyer and seller is for bread, and if you buy bread you get what you want. It’s a complete contract (remember, a contract need not be in writing and it need not be signed to be enforceable: your receipt is enough to get a refund if the bag labelled ‘fresh bread’ turned out to contain a week-old loaf when you got home). In contrast, in the labour market, the employment contract is usually for the employee’s work time and not for the work itself. Because it is the employee’s work that produces the firm’s goods and is essential to the firm’s profits, this means the contract is an incomplete contract: something that matters to one of the parties to the exchange is not covered in the contract. The implication is that, in contrast to the bread market, for a buyer in the labour market, paying more than is necessary to buy the employee’s time is not throwing away money; it is the way that employers get what they want (work) and how they make profits. And because they are deciding on the price (that is, the wage) that they will offer the worker, they are price-setters and not price-takers. This is why Unit 8’s model of the competitive equilibrium of price-takers does not work in the labour market. In Unit 4, you encountered many situations in which the Nash equilibrium of some social interaction is not Pareto efficient. Examples include the prisoners’ dilemma and the public goods game. We use the Nash equilibrium: This concept helps us predict what outcomes we will observe when people interact. We use Pareto efficiency: This concept evaluates whether there is some other outcome in which all parties might have done better (or at least as well). Recall from Unit 8 that in the model we illustrated with the bread market, there were no unexploited opportunities for mutual gain at the competitive equilibrium (where the demand and supply curves intersect). In this situation, it is not possible to make one of the buyers or sellers better off—by having one of them trade more or less with their exchange partner, for example—without making at least one of them worse off. The outcome therefore was Pareto efficient. This is not the case in the labour market. Competition among many buyers (firms hiring employees) and sellers (people seeking work) results in an equilibrium outcome—the wage w* and the level of employment N*—that is not Pareto efficient. What this means is that there is some other outcome—a different wage and level of employment that is feasible from the standpoint of the available resources and technology—that both employers and employees would prefer. For the unemployed worker, getting a job makes a big difference. She now receives an employment rent, which measures how much better it is for her to have a job than not. The deal is a good one for her despite the fact that the employment rent she receives is slightly lower than that received by other workers (because her wage is slightly lower). This little example shows that there is some other technically feasible outcome—employ N* + 1 workers at the wage w* for N* of them and w* minus a little bit for the last worker hired—that would be an improvement for both the unemployed worker and the employer. So the outcome (N*, w*) is Pareto inefficient. But if that is the case, why doesn’t the employer hire the unemployed person? The answer is that the deal, while technically feasible, is not economically possible. This is because there is no way to enforce the unemployed person’s promise to work as hard as the rest in return for a slightly lower wage. Remember the w* on the wage-setting curve is the minimum the firm can pay to identical workers to ensure work effort is adequate. The problem thus goes back to a fundamental fact about the relationship between the firm and its employees: the contract is incomplete in that it cannot ensure a given level of effort from the worker. The Nash equilibrium in the labour market is Pareto inefficient. Here is another difference between the bread market and the barista market. The baker probably does not know the name of the person buying the bread, or anything about the buyer other than that he is offering the right price for the loaf. The buyer most likely cares equally little about the baker other than the taste of the bread. Now think about the barista. What are the chances that she does not know the name of her immediate supervisor? And vice versa? Why the difference? The bread market tends to be a one-off interaction among virtual strangers, while the labour market is an ongoing interaction among people who not only know each other’s names but also care about what the other person is like. The barista’s supervisor cares about what the barista is like because her personality, loyalty to the brand, and her respect for social norms such as honesty and hard work will influence the quality and quantity of effort that she puts into the job. The buyer of the bread does not care about these aspects of the baker because what matters is the quality of the loaf, which can be easily determined, and a new bakery readily found if the taste is not right. Another major difference is that the supervisor directs what the barista does—to dress a certain way, to show up at work at a certain time, and to not waste time on the job—with the expectation that she will comply with his orders. Because she receives an employment rent which she would lose if he were to dismiss her, he can exercise power over her, getting her to do things that she might not do without the threat of dismissal. This is not the case in the bread market. If the buyer complains about the baker’s attire, he would be invited to shop elsewhere. The difference is that neither the buyer nor the seller in the bread market is receiving a rent. For each of them, the transaction they are undertaking yields them benefits virtually identical to their next best alternative. When both can walk away at virtually no cost, then neither can exercise power over the other. These are some of the differences—both economic and also political and sociological—between the bread market and the barista market. These are also the reasons why the model of the bread market with price-taking buyers and sellers, and market clearing in equilibrium, does not work for the labour market. The table in Figure 9.26 summarizes the differences. Competition among sellers? Yes: There are many bakeries competing to sell bread. Yes: There are many actual or would-be baristas competing to sell their time. Is the contract complete? Yes: If the bag labeled bread did not contain bread, you get your money back. No: The firm’s profits depend on the worker’s effort per hour/week/month worked, which is not in the contract. Price-taking buyers? Yes: Individual buyers cannot bargain for a lower price than others are willing to pay (and would not want to pay more). No: The buyer (the firm) sets the wage to minimize the cost of getting the worker to work; it cannot benefit by offering the lowest wage at which the worker (the seller) would accept the job. Is there excess supply or demand in equilibrium? No: The market clears. Sales take place at the lowest price the seller would accept. Yes: Firms offer a wage higher than the worker’s reservation wage (minimum price the seller would accept) to maximize their profits. Differences between the labour market and competitive goods markets. Figure 9.26 Differences between the labour market and competitive goods markets. Contracts are complete in both competitive goods markets and labour markets. In a competitive goods market the buyers are price-takers, while in a labour market the buyers of employment (the firms) are price-setters. There is no economic rent for either the buyers or the sellers in competitive goods markets. In contrast, in labour markets the sellers receive economic rents. Social norms do not affect the outcomes in either goods markets or in labour markets. In a competitive goods market, if what you buy is not what is advertised, then you can pursue the seller in court to ensure that the contract is fulfilled. In a labour market, the contract is for the employee’s work time, and not for the work (or the effort) itself, and therefore it is incomplete. In a competitive goods market, individual buyers cannot bargain for a lower price than others are willing to pay. Therefore they are price-takers. In the labour market the firms set the wage to minimize the cost of getting the worker to work and would not benefit by offering the lowest wage at which the worker (the seller) would accept the job. Hence they are price-setters. In a competitive goods market, the buyers’ next best alternative is to buy at another shop, while the sellers’ next best alternative is to sell to another customer. Neither party is any worse off from leaving and therefore they do not receive economic rents. In contrast, in the labour market the sellers (the employees) are worse off in their alternative of being unemployed. Hence they receive employment rents. In goods markets, contracts are enforced, if necessary, by courts and not by norms. On the other hand, in labour markets the employees’ work ethic and/or feelings of reciprocity towards their employer affect their productivity on the job. The model of the labour market is quite different from the model of equilibrium of price-taking buyers and sellers in Unit 8. The most obvious difference is that the labour market does not clear, even in equilibrium. Employers and workers have a conflict of interest: This is over how hard employees work. Employers cannot write a complete contract with their employees: They cannot specify the quality and quantity of work effort they will receive. The extent of equilibrium unemployment is affected by how governments regulate labour and other markets. In Units 16 and 17 we shall see how these policies and the behaviour of labour unions and employers have affected the unemployment experience of different countries over the past few decades. Unemployment can be higher than equilibrium unemployment as a result of a fall in the economy-wide demand for goods and services. In the example of the Greys in Australia, this was due to global movements in demand for commodities. But there are many other causes of fluctuations in aggregate demand that will be explored in the coming units. Where unemployment is raised above the equilibrium level because of a lack of aggregate demand, governments and central banks can use fiscal and monetary policies to reduce it. This is likely to work better than relying on firms to cut wages and prices, and on households and firms to respond to those falling wages and prices by increasing their purchases. The principal–agent model of the employer and the employee that we have used in this unit will appear in a new setting in the next unit: the credit market. Whereas in the labour market the principal is the employer and the agent the worker, in the credit market the principal is the lender and the agent the borrower. We saw here that in the labour market equilibrium there will be some people involuntarily unemployed, seeking a job and willing to work at the going wage rate. So, also, we will see that in the credit market there will be people seeking loans and willing to pay the going rate of interest, but unable to get a loan. Carlin, Wendy and David Soskice. 2015. Macroeconomics: Institutions, Instability, and the Financial System. Oxford: Oxford University Press. Chapters 2 and 15.